Sanskrit (/ˈsænskrɪt/; Sanskrit: संस्कृतम्, translit. saṃskṛtam, pronounced [sɐ̃skɽɪtɐm] ( listen)) is a language of ancient India with a history going back about 3,500 years. It is the primary liturgical language of Hinduism and the predominant language of most works of Hindu philosophy as well as some of the principal texts of Buddhism and Jainism. Sanskrit, in its variants and numerous dialects, was the lingua franca of ancient and medieval India. In the early 1st millennium CE, along with Buddhism and Hinduism, Sanskrit migrated to Southeast Asia, parts of East Asia and Central Asia, emerging as a language of high culture and of local ruling elites in these regions. 24,821 people in India have registered Sanskrit as their mother tongue. also written in various other Brahmic scripts. Sanskrit is an Old Indo-Aryan language. As one of the oldest documented members of the Indo-European family of languages,[note 1][note 2] Sanskrit holds a prominent position in Indo-European studies. It is related to Greek and Latin, as well as Hittite, Luwian, Old Avestan and many other extinct languages with historical significance to Europe, West Asia, Central Asia, and South Asia. It traces its linguistic ancestry to the Proto-Indo-Aryan language, Proto-Indo-Iranian and the Proto-Indo-European languages. Sanskrit is traceable to the 2nd millennium BCE in a form known as Vedic Sanskrit, with the Rigveda as the earliest known composition. A more refined and standardized grammatical form called Classical Sanskrit emerged in the mid-1st millennium BCE with the Aṣṭādhyāyī treatise of Pāṇini. Sanskrit, though not necessarily Classical Sanskrit, is the root language of many Prakrit languages. Examples include numerous, modern, North Indian, subcontinental daughter languages such as Hindi, Marathi, Bengali, Punjabi and Nepali. The body of Sanskrit literature encompasses a rich tradition of philosophical and religious texts, as well as poetry, music, drama, scientific, technical and other texts. In the ancient era, Sanskrit compositions were orally transmitted by methods of memorisation of exceptional complexity, rigour and fidelity. The earliest known inscriptions in Sanskrit are from the 1st-century BCE, such as the few discovered in Ayodhya and Ghosundi-Hathibada (Chittorgarh). [note 3] Sanskrit texts dated to the 1st millennium CE were written in the Brahmi script, the Nāgarī script, the historic South Indian scripts and their derivative scripts. Sanskrit is one of the 22 languages listed in the Eighth Schedule of the Constitution of India. It continues to be widely used as a ceremonial and ritual language in Hinduism and some Buddhist practices such as hymns and chants. Historic Sanskrit manuscripts: a religious text (top), and a medical text. In Sanskrit verbal adjective sáṃskṛta- is a compound word consisting of sam (together, good, well, perfected) and krta- (made, formed, work). It connotes a work that has been "well prepared, pure and perfect, polished, sacred". According to Biderman, the perfection contextually being referred to in the etymological origins of the word is its tonal--rather than semantic--qualities. Sound and oral transmission were highly valued qualities in ancient India, and its sages refined the alphabet, the structure of words and its exacting grammar into a "collection of sounds, a kind of sublime musical mold", states Biderman, as an integral language they called Sanskrit. From the late Vedic period onwards, state Annette Wilke and Oliver Moebus, resonating sound and its musical foundations attracted an "exceptionally large amount of linguistic, philosophical and religious literature" in India. Sound was visualized as "pervading all creation", another representation of the world itself; the "mysterious magnum" of Hindu thought. The search for perfection in thought and the goal of salvation were among the dimensions of sacred sound, and the common thread that weaved all ideas and inspirations became the quest for what the ancient Indians believed to be a perfect language, the "phonocentric episteme" of Sanskrit. Sanskrit as a language competed with numerous, less exact vernacular Indian languages called Prakritic languages (prākṛta-). The term prakrta literally means "original, natural, normal, artless", states Franklin Southworth. The relationship between Prakrit and Sanskrit is found in Indian texts dated to the 1st millennium CE. Patañjali acknowledged that Prakrit is the first language, one instinctively adopted by every child with all its imperfections and later leads to the problems of interpretation and misunderstanding. The purifying structure of the Sanskrit language removes these imperfections. The early Sanskrit grammarian Daṇḍin states, for example, that much in the Prakrit languages is etymologically rooted in Sanskrit, but involve "loss of sounds" and corruptions that result from a "disregard of the grammar". Daṇḍin acknowledged that there are words and confusing structures in Prakrit that thrive independent of Sanskrit. This view is found in the writing of Bharata Muni, the author of the ancient Nāṭyaśāstra text. The early Jain scholar Namisādhu acknowledged the difference, but disagreed that the Prakrit language was a corruption of Sanskrit. Namisādhu stated that the Prakrit language was the pūrvam (came before, origin) and that it came naturally to women and children, while Sanskrit was a refinement of Prakrit through "purification by grammar". 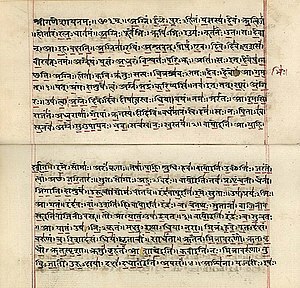 Vedic Sanskrit (c. 1500 – 500 BCE). Mycenaean Greek (c. 1450 BCE) and Ancient Greek (c. 750 – 400 BC). Mycenaean Greek is the oldest recorded form of Greek, but the limited material that has survived has a highly ambiguous writing system. More important to Indo-European studies is Ancient Greek, documented extensively beginning with the two Homeric poems (the Iliad and the Odyssey, c. 750 BC). Hittite (c. 1750 – 1200 BCE). This is the earliest-recorded of all Indo-European languages, distinguishable into Old Hittite, Middle Hittite and Neo-Hittite. It is divergent from the others likely due to its early separation. Discovered on clay tablets of central Turkey in cuneiform script, it possesses some highly archaic features found only fragmentarily, if at all, in other languages. At the same time, however, it appears to have undergone a large number of early phonological and grammatical changes along with the ambiguities of its writing system. Other Indo-European languages related to Sanskrit include archaic and classical Latin (c. 600 BCE – 100 CE, old Italian), Gothic (archaic Germanic language, c. 350 CE), Old Norse (c. 200 CE and after), Old Avestan (c. late 2nd millennium BCE) and Younger Avestan (c. 900 BCE). The closest ancient relatives of Vedic Sanskrit in the Indo-European languages are the Nuristani language found in the remote Hindu Kush region of the northeastern Afghanistan and northwestern Himalayas, as well as the extinct Avestan and Old Persian – both Iranian languages. Sanskrit belongs to the satem group of the Indo-European Languages. The Sanscrit language, whatever be its antiquity, is of a wonderful structure; more perfect than the Greek, more copious than the Latin, and more exquisitely refined than either, yet bearing to both of them a stronger affinity, both in the roots of verbs and the forms of grammar, than could possibly have been produced by accident; so strong indeed, that no philologer could examine them all three, without believing them to have sprung from some common source, which, perhaps, no longer exists. There is a similar reason, though not quite so forcible, for supposing that both the Gothick and the Celtick [sic], though blended with a very different idiom, had the same origin with the Sanscrit; and the Old Persian might be added to the same family. In order to explain the common features shared by Sanskrit and other Indo-European languages, the Indo-Aryan migration theory states that the original speakers of what became Sanskrit arrived in the Indian subcontinent from the north-west sometime during the early second millennium BCE. Evidence for such a theory includes the close relationship between the Indo-Iranian tongues and the Baltic and Slavic languages, vocabulary exchange with the non-Indo-European Uralic languages, and the nature of the attested Indo-European words for flora and fauna. The pre-history of Indo-Aryan languages which preceded Vedic Sanskrit is unclear and various hypotheses place it over a fairly wide limit. According to Thomas Burrow, based on the relationship between various Indo-European languages, the origin of all these languages may possibly be in what is now Central or Eastern Europe, while the Indo-Iranian group possibly arose in Central Russia. The Iranian and Indo-Aryan branches separated quite early. It is the Indo-Aryan branch that moved into eastern Iran and the south into the Indian subcontinent in the first half of the 2nd millennium BCE. Once in ancient India, the Indo-Aryan language underwent rapid linguistic change and morphed into the Vedic Sanskrit language. The pre-Classical form of Sanskrit is known as Vedic Sanskrit. The earliest attested Sanskrit text is the Rigveda, a Hindu scripture, from the mid-to-late second millennium BCE. No written records from such an early period survive if they ever existed. However, scholars are confident that the oral transmission of the texts is reliable: they were ceremonial literature where the exact phonetic expression and its preservation were a part of the historic tradition. The Rigveda is a collection of books, created by multiple authors from distant parts of ancient India. These authors represented different generations, and the mandalas 2 to 7 are the oldest while the mandalas 1 and 10 are relatively the youngest. Yet, the Vedic Sanskrit in these books of the Rigveda "hardly presents any dialectical diversity", states Louis Renou – an Indologist known for his scholarship of the Sanskrit literature and the Rigveda in particular. According to Renou, this implies that the Vedic Sanskrit language had a "set linguistic pattern" by the second half of the 2nd-millennium BCE. Beyond the Rigveda, the ancient literature in Vedic Sanskrit that has survived into the modern age include the Samaveda, Yajurveda, Atharvaveda along with the embedded and layered Vedic texts such as the Brahmanas, Aranyakas and the early Upanishads. These Vedic documents reflect the dialects of Sanskrit found in the various parts of the northwestern, northern and eastern Indian subcontinent. Vedic Sanskrit was both a spoken and literary language of ancient India. According to Michael Witzel, Vedic Sanskrit was a spoken language of the semi-nomadic Aryas who temporarily settled in one place, maintained cattle herds, practiced limited agriculture and after some time moved by wagon trains they called grama. The Vedic Sanskrit language or a closely related Indo-European variant was recognized beyond ancient India as evidenced by the "Mitanni Treaty" between the ancient Hittite and Mitanni people, carved into a rock, in a region that are now parts of Syria and Turkey. [note 5] Parts of this treaty such as the names of the Mitannian princes and technical terms related to horse training, for reasons not understood, are in early forms of Vedic Sanskrit. The treaty also invokes the gods Varuna, Mitra, Indra and Nasatya found in the earliest layers of the Vedic literature. an auspicious mark placed on their language. The Vedic Sanskrit found in the Rigveda is distinctly more archaic than other Vedic texts, and in many respects, the Rigvedic language is notably more similar to those found in the archaic texts of Old Avestan Zoroastrian Gathas and Homer's Iliad and Odyssey. According to Stephanie W. Jamison and Joel P. Brereton – Indologists known for their translation of the Rigveda, the Vedic Sanskrit literature "clearly inherited" from Indo-Iranian and Indo-European times, the social structures such as the role of the poet and the priests, the patronage economy, the phrasal equations and some of the poetic meters. [note 6] While there are similarities, state Jamison and Brereton, there are also differences between Vedic Sanskrit, the Old Avestan, and the Mycenaean Greek literature. For example, unlike the Sanskrit similes in the Rigveda, the Old Avestan Gathas lack simile entirely, and it is rare in the later version of the language. The Homerian Greek, like Rigvedic Sanskrit, deploys simile extensively, but they are structurally very different. The early Vedic form of the Sanskrit language was far less homogenous, and it evolved over time into a more structured and homogeneous language, ultimately into the Classical Sanskrit by about the mid-1st-millennium BCE. According to Richard Gombrich – an Indologist and a scholar of Sanskrit, Pāli and Buddhist Studies – the archaic Vedic Sanskrit found in the Rigveda had already evolved in the Vedic period, as evidenced in the later Vedic literature. The language in the early Upanishads of Hinduism and the late Vedic literature approaches Classical Sanskrit, while the archaic Vedic Sanskrit had by the Buddha's time become unintelligible to all except ancient Indian sages, states Gombrich. The formalization of the Sanskrit language is credited to Pāṇini, along with Patanjali's Mahabhasya and Katyayana's commentary that preceded Patanjali's work. Panini composed Aṣṭādhyāyī ("Eight-Chapter Grammar"). The century in which he lived is unclear and debated, but his work is generally accepted to be from sometime between 6th and 4th centuries BCE. The Aṣṭādhyāyī was not the first description of Sanskrit grammar, but it is the earliest that has survived in full. Pāṇini cites ten scholars on the phonological and grammatical aspects of the Sanskrit language before him, as well as the variants in the usage of Sanskrit in different regions of India. The ten Vedic scholars he quotes are Apisali, Kashyapa, Gargya, Galava, Cakravarmana, Bharadvaja, Sakatayana, Sakalya, Senaka and Sphotayana. The Aṣṭādhyāyī of Panini became the foundation of Vyākaraṇa, a Vedanga. In the Aṣṭādhyāyī, language is observed in a manner that has no parallel among Greek or Latin grammarians. Pāṇini's grammar, according to Renou and Filliozat, defines the linguistic expression and a classic that set the standard for the Sanskrit language. Pāṇini made use of a technical metalanguage consisting of a syntax, morphology and lexicon. This metalanguage is organised according to a series of meta-rules, some of which are explicitly stated while others can be deduced. The history of linguistics begins not with Plato or Aristotle, but with the Indian grammarian Panini. The Classical Sanskrit language formalized by Panini, states Renou, is "not an impoverished language", rather it is "a controlled and a restrained language from which archaisms and unnecessary formal alternatives were excluded". The Classical form of the language simplified the sandhi rules but retained various aspects of the Vedic language, while adding rigor and flexibilities, so that it had sufficient means to express thoughts as well as being "capable of responding to the future increasing demands of an infinitely diversified literature", according to Renou. Panini included numerous "optional rules" beyond the Vedic Sanskrit's bahulam framework, to respect liberty and creativity so that individual writers separated by geography or time would have the choice to express facts and their views in their own way, where tradition followed competitive forms of the Sanskrit language. The phonetic differences between Vedic Sanskrit and Classical Sanskrit are negligible when compared to the intense change that must have occurred in the pre-Vedic period between Indo-Aryan language and the Vedic Sanskrit. The noticeable differences between the Vedic and the Classical Sanskrit include the much-expanded grammar and grammatical categories as well as the differences in the accent, the semantics and the syntax. There are also some differences between how some of the nouns and verbs end, as well as the sandhi rules, both internal and external. Quite many words found in the early Vedic Sanskrit language are never found in late Vedic Sanskrit or Classical Sanskrit literature, while some words have different and new meanings in Classical Sanskrit when contextually compared to the early Vedic Sanskrit literature. Arthur Macdonell was among the early colonial era scholars who summarized some of the differences between the Vedic and Classical Sanskrit. Louis Renou published in 1956, in French, a more extensive discussion of the similarities, the differences and the evolution of the Vedic Sanskrit within the Vedic period and then to the Classical Sanskrit along with his views on the history. This work has been translated by Jagbans Balbir. Sanskrit's link to the Prakrit languages and other Indo-European languages. Colonial era scholars questioned whether Sanskrit was ever a spoken language, or was it only a literary language? Scholars disagree in their answers. A section of Western scholars state that Sanskrit was never a spoken language, while others and particularly most Indian scholars state the opposite. Those who affirm Sanskrit to have been a vernacular language point to the necessity of Sanskrit being a spoken language for the oral tradition that preserved the vast number of Sanskrit manuscripts from ancient India. Secondly, they state that the textual evidence in the works of Yaksa, Panini and Patanajali affirms that the Classical Sanskrit in their era was a language that is spoken (bhasha) by the cultured and educated. Some sutras expound upon the variant forms of spoken Sanskrit versus written Sanskrit. The 7th-century Chinese Buddhist pilgrim Xuanzang mentioned in his memoir that official philosophical debates in India were held in Sanskrit, not in the vernacular language of that region. According to Sanskrit linguist Madhav Deshpande, Sanskrit was a spoken language in a colloquial form by the mid 1st millennium BCE which coexisted with a more formal, grammatical correct form of literary Sanskrit. This, states Deshpande, is true for modern languages where colloquial incorrect approximations and dialects of a language are spoken and understood, along with more "refined, sophisticated and grammatically accurate" forms of the same language being found in the literary works. The Indian tradition, states Moriz Winternitz, has favored the learning and the usage of multiple languages from the ancient times. Sanskrit was a spoken language in the educated and the elite classes, but it was also a language that must have been understood in a wider circle of society because the widely popular folk epics and stories such as the Ramayana, the Mahabharata, the Bhagavata Purana, the Panchatantra and many other texts are all in the Sanskrit language. The Classical Sanskrit with its exacting grammar was thus the language of the Indian scholars and the educated classes, while others communicated with approximate or ungrammatical variants of it as well as other natural Indian languages. Sanskrit, as the learned language of Ancient India, thus existed alongside the vernacular Prakrits. Many Sanskrit dramas indicate that the language coexisted with the vernacular Prakrits. Centres in Varanasi, Paithan, Pune and Kanchipuram were centers of classical Sanskrit learning and public debates until the arrival of the colonial era. According to Étienne Lamotte – an Indologist and Buddhism scholar, Sanskrit became the dominant literary and inscriptional language because of its precision in communication. It was, states Lamotte, an ideal instrument for presenting ideas and as knowledge in Sanskrit multiplied so did its spread and influence. Sanskrit was adopted voluntarily as a vehicle of high culture, arts, and profound ideas. Pollock disagrees with Lamotte, but concurs that Sanskrit's influence grew into what he terms as "Sanskrit Cosmopolis" over a region that included all of South Asia and much of southeast Asia. The Sanskrit language cosmopolis thrived beyond India between 300 and 1300 CE. Extant manuscripts in Sanskrit number over 30 million, one hundred times those in Greek and Latin combined, constituting the largest cultural heritage that any civilization has produced prior to the invention of the printing press. Sanskrit has been the predominant language of Hindu texts encompassing a rich tradition of philosophical and religious texts, as well as poetry, music, drama, scientific, technical and others. It is the predominant language of one of the largest collection of historic manuscripts. The earliest known inscriptions in Sanskrit are from the 1st-century BCE, such as the Ayodhya Inscription of Dhana and Ghosundi-Hathibada (Chittorgarh). Though developed and nurtured by scholars of orthodox schools of Hinduism, Sanskrit has been the language for some of the key literary works and theology of heterodox schools of Indian philosophies such as Buddhism and Jainism. The structure and capabilities of the Classical Sanskrit language launched ancient Indian speculations about "the nature and function of language", what is the relationship between words and their meanings in the context of a community of speakers, whether this relationship is objective or subjective, discovered or is created, how individuals learn and relate to the world around them through language, and about the limits of language? They speculated on the role of language, the ontological status of painting word-images through sound, and the need for rules so that it can serve as a means for a community of speakers, separated by geography or time, to share and understand profound ideas from each other. [note 11] These speculations became particularly important to the Mimamsa and the Nyaya schools of Hindu philosophy, and later to Vedanta and Mahayana Buddhism, states Frits Staal – a scholar of Linguistics with a focus on Indian philosophies and Sanskrit. Though written in a number of different scripts, the dominant language of Hindu texts has been Sanskrit. It or a hybrid form of Sanskrit became the preferred language of Mahayana Buddhism scholarship. One of the early and influential Buddhist philosopher Nagarjuna (~200 CE), for example, used Classical Sanskrit as the language for his texts. According to Renou, Sanskrit had a limited role in the Theravada tradition (formerly known as the Hinayana) but the Prakrit works that have survived are of doubtful authenticity. Some of the canonical fragments of the early Buddhist traditions, discovered in the 20th-century, suggest the early Buddhist traditions did use of imperfect and reasonably good Sanskrit, sometimes with a Pali syntax, states Renou. The Mahāsāṃghika and Mahavastu, in their late Hinayana forms, used hybrid Sanskrit for their literature. Sanskrit was also the language of some of the oldest surviving, authoritative and much followed philosophical works of Jainism such as the Tattvartha Sutra by Umaswati. A 5th-century Sanskrit inscription discovered in Java Indonesia – one of earliest in southeast Asia. The Ciaruteun inscription combines two writing scripts and compares the king to Hindu god Vishnu. It provides a terminus ad quem to the presence of Hinduism in the Indonesian islands. The oldest southeast Asian Sanskrit inscription –- called the Vo Canh inscription – so far discovered is near Nha Trang, Vietnam, and it is dated to the late 2nd-century to early 3rd-century CE. The Sanskrit language has been one of the major means for the transmission of knowledge and ideas in Asian history. Indian texts in Sanskrit were already in China by 402 CE, carried by the influential Buddhist pilgrim Faxian who translated them into Chinese by 418 CE. Xuanzang, another Chinese Buddhist pilgrim, learnt Sanskrit in India and carried 657 Sanskrit texts to China in the 7th-century where he established a major center of learning and language translation under the patronage of Emperor Taizong. By the early 1st millennium CE, Sanskrit had spread Buddhist and Hindu ideas to Southeast Asia, parts of the East Asia and the Central Asia. It was accepted as a language of high culture and the preferred language by some of the local ruling elites in these regions. According to the Dalai Lama, the Sanskrit language is a parent language that is at the foundation of many modern languages of India and the one that promoted Indian thought to other distant countries. In Tibetan Buddhism, states the Dalai Lama, Sanskrit language has been a revered one and called legjar lhai-ka or "elegant language of the gods". It has been the means of transmitting the "profound wisdom of Buddhist philosophy" to Tibet. The Sanskrit language created a pan-Indic accessibility to information and knowledge in the ancient and medieval times, in contrast to the Prakrit languages which were understood just regionally. It created a cultural bond across the subcontinent. As local languages and dialects evolved and diversified, Sanskrit served as the common language. It connected scholars from distant parts of the Indian subcontinent such as Tamil Nadu and Kashmir, states Deshpande, as well as those from different fields of studies, though there must have been differences in its pronunciation given the first language of the respective speakers. The Sanskrit language brought Indic people together, particularly its elite scholars. Some of these scholars of Indian history regionally produced vernacularized Sanskrit to reach wider audiences, as evidenced by texts discovered in Rajasthan, Gujarat, and Maharashtra. Once the audience became familiar with the easier to understand vernacularized version of Sanskrit, those interested could graduate from colloquial Sanskrit to the more advanced Classical Sanskrit. Rituals and the rites-of-passage ceremonies have been and continue to be the other occasions where a wide spectrum of people hear Sanskrit, and occasionally join in to speak some Sanskrit words such as "namah". Classical Sanskrit is the standard register as laid out in the grammar of Pāṇini, around the fourth century BCE. Its position in the cultures of Greater India is akin to that of Latin and Ancient Greek in Europe. Sanskrit has significantly influenced most modern languages of the Indian subcontinent, particularly the languages of the northern, western, central and eastern Indian subcontinent. Sanskrit declined starting about and after the 13th-century. This coincides with the beginning of Islamic invasions of the Indian subcontinent to create, thereafter expand the Muslim rule in the form of Sultanates and later the Mughal Empire. With the fall of Kashmir around the 13th-century, a premier center of Sanskrit literary creativity, Sanskrit literature there disappeared, perhaps in the "fires that periodically engulfed the capital of Kashmir" or the "Mongol invasion of 1320" states Sheldon Pollock. :397–398 The Sanskrit literature which was once widely disseminated out of the northwest regions of the subcontinent, stopped after the 12th-century. :398 As Hindu kingdoms fell in the eastern and the South India, such as the great Vijayanagara Empire, so did Sanskrit. There were exceptions and short periods of imperial support for Sanskrit, mostly concentrated during the reign of the tolerant Mughal emperor Akbar. Muslim rulers patronized the Middle Eastern language and scripts found in Persia and Arabia, and the Indians linguistically adapted to this Persianization to gain employment with the Muslim rulers. Hindu rulers such as Shivaji of the Maratha Empire, reversed the process, by re-adopting Sanskrit and re-asserting their socio-linguistic identity. After Islamic rule disintegrated in the Indian subcontinent and the colonial rule era began, Sanskrit re-emerged but in the form of a "ghostly existence" in regions such as Bengal. This decline was the result of "political institutions and civic ethos" that did not support the historic Sanskrit literary culture. 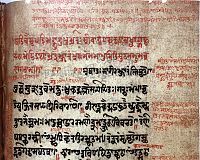 Sanskrit language manuscripts exist in many scripts. Above from top: Isha Upanishad (Devanagari), Samaveda (Tamil Grantha), Bhagavad Gita (Gurmukhi), Vedanta Sara (Telugu), Jatakamala (early Sharada). All are Hindu texts except the last Buddhist text. The Sanskrit language, states Moriz Winternitz, was never a dead language and it is still alive though its prevalence is lesser than ancient and medieval times. Sanskrit remains an integral part of Hindu journals, festivals, Ramlila plays, drama, rituals and the rites-of-passage. Similarly, Brian Hatcher states that the "metaphors of historical rupture" by Pollock are not valid, that there is ample proof that Sanskrit was very much alive in the narrow confines of surviving Hindu kingdoms between the 13th and 18th-century, and its reverence and tradition continues. Hanneder states that modern works in Sanskrit are either ignored or their "modernity" contested. [verification needed] According to Robert Goldman and Sally Sutherland, Sanskrit is neither "dead" nor "living" in the conventional sense. It is a special, timeless language that lives in the numerous manuscripts, daily chants and ceremonial recitations, a heritage language that Indians contextually prize and some practice. When the British introduced English to India in the 19th century, knowledge of Sanskrit and ancient literature continued to flourish as the study of Sanskrit changed from a more traditional style into a form of analytical and comparative scholarship mirroring that of Europe. The relationship of Sanskrit to the Prakrit languages, particularly the modern form of Indian languages, is complex and spans about 3,500 years, states Colin Masica – a linguist specializing in South Asian languages. A part of the difficulty is the lack of sufficient textual, archaeological and epigraphical evidence for the ancient Prakrit languages with rare exceptions such as Pali, leading to a tendency of anachronistic errors. Sanskrit and Prakrit languages may be divided into Old Indo-Aryan (1500 BCE-600 BCE), Middle Indo-Aryan (600 BCE-1000 CE) and New Indo-Aryan (1000 CE-current), each can further be subdivided in early, middle or second, and late evolutionary substages. Vedic Sanskrit belongs to the early Old Indo-Aryan while Classical Sanskrit to the later Old Indo-Aryan stage. The evidence for Prakrits such as Pali (Theravada Buddhism) and Ardhamagadhi (Jainism), along with Magadhi, Maharashtri, Sinhala, Sauraseni and Niya (Gandhari), emerge in the Middle Indo-Aryan stage in two versions – archaic and more formalized – that may be placed in early and middle substages of the 600 BCE-1000 CE period. Two literary Indic languages can be traced to the late Middle Indo-Aryan stage and these are Apabhramsa and Elu (a form of literary Sinhalese). Numerous North, Central, Eastern and Western Indian languages, such as Hindi, Gujarati, Sindhi, Punjabi, Kashmiri, Nepali, Braj, Awadhi, Bengali, Assamese, Oriya, Marathi, and others belong to the New Indo-Aryan stage. There is an extensive overlap in the vocabulary, phonetics and other aspects of these New Indo-Aryan languages with Sanskrit, but it is neither universal nor identical across the languages. They likely emerged from a synthesis of the ancient Sanskrit language traditions and an admixture of various regional dialects. Each language has some unique and regionally creative aspects, with unclear origins. Prakrit languages do have a grammatical structure, but like the Vedic Sanskrit, it is far less rigorous than Classical Sanskrit. The roots of all Prakrit languages may be in the Vedic Sanskrit and ultimately the Indo-Aryan language, their structural details vary from the Classical Sanskrit. It is generally accepted by scholars and widely believed in India that the modern Indic languages, such as Bengali, Gujarati, Hindi and Punjabi are descendants of the Sanskrit language. Sanskrit, states Burjor Avari, can be described as "the mother language of almost all the languages of north India". Sanskrit language's historical presence has been attested in many countries. The evidence includes manuscript pages and inscriptions discovered in South Asia, Southeast Asia and Central Asia. These have been dated between 300 and 1800 CE. The Sanskrit language's historic presence is attested across a wide geography beyond the Indian subcontinent. Inscriptions and literary evidence suggests that Sanskrit language was already being adopted in Southeast Asia and Central Asia in the 1st-millennium CE, through monks, religious pilgrims and merchants. The Indian subcontinent has been the geographic range of the largest collection of the ancient and pre-18th century Sanskrit manuscripts and inscriptions. Beyond ancient India, significant collections of Sanskrit manuscripts and inscriptions have been found in China (particularly the Tibetan monasteries), Myanmar, Indonesia, Cambodia, Laos, Vietnam, Thailand, and Malaysia. Sanskrit inscriptions, manuscripts or its remnants, including some of the oldest known Sanskrit written texts, have been discovered in dry high deserts and mountainous terrains such as in Nepal,[note 12] Tibet, Afghanistan, Mongolia, Uzbekistan, Turkmenistan, Tajikistan, and Kazakhstan. Some Sanskrit texts and inscriptions have also been discovered in Korea and Japan. In India, Sanskrit is among the 22 official languages of India in the Eighth Schedule to the Constitution. The state of Uttarakhand in India lists Sanskrit as its second official language. Sanskrit shares many Proto-Indo-European phonological features, although it features a larger inventory of distinct phonemes. The consonantal system is the same, though it systematically enlarged the inventory of distinct sounds. For example, Sanskrit added a voiceless aspirated "tʰ", to the voiceless "t", voiced "d" and voiced aspirated "dʰ" found in PIE languages. The most significant and distinctive phonological development in Sanskrit is vowel-merger, states Stephanie Jamison – an Indo-European linguist specializing in Sanskrit literature. The short ∗e, ∗o and *a, all merge as "a" (अ) in Sanskrit, while long ∗ē, ∗ō and *ā, all merge as long "ā" (आ). These mergers occurred very early and significantly impacted Sanskrit's morphological system. Some phonological developments in it mirror those in other PIE languages. For example, the labiovelars merged with the plain velars as in other satem languages. However, the secondary palatalization of the resulting segments is more thorough and systematic within Sanskrit, states Jamison. A series of retroflex dental stops were innovated in Sanskrit to more thoroughly articulate sounds for clarity. For example, unlike the loss of the morphological clarity from vowel contraction that is found in early Greek and related southeast European languages, Sanskrit deployed ∗y, ∗w, and ∗s intervocalically to provide morphological clarity. The cardinal vowels (svaras) i (इ), u (उ), a (अ) distinguish length in Sanskrit, states Jamison. The short a (अ) in Sanskrit is a closer vowel than ā, equivalent to schwa. The mid vowels ē (ए) and ō (ओ) in Sanskrit are monophthongizations of the Indo-Iranian diphthongs ∗ai and ∗au. The Old Iranian language preserved *ai and ∗au. The Sanskrit vowels are inherently long, though often transcribed e and o without the diacritic. The vocalic liquid r̥ in Sanskrit is a merger of PIE ∗r̥ and ∗l̥. The long r̥ is an innovation and it is used in a few analogically generated morphological categories. This is one of the oldest surviving and dated palm-leaf manuscript in Sanskrit (828 CE). Discovered in Nepal, the bottom leaf shows all the vowels and consonants of Sanskrit (the first five consonants are highlighted in blue and yellow). According to Masica, Sanskrit has four traditional semivowels, with which were classed, "for morphophonemic reasons, the liquids: y, r, l, and v; that is, as y and v were the non-syllabics corresponding to i, u, so were r, l in relation to r̥ and l̥". The northwestern, the central and the eastern Sanskrit dialects have had a historic confusion between "r" and "l". The Paninian system that followed the central dialect preserved the distinction, likely out of reverence for the Vedic Sanskrit that distinguished the "r" and "l". However, the northwestern dialect only had "r", while the eastern dialect probably only had "l", states Masica. Thus literary works from different parts of ancient India appear inconsistent in their use of "r" and "l", resulting in doublets that is occasionally semantically differentiated. Sanskrit possesses a symmetric consonantal phoneme structure based on how the sound is articulated, though the actual usage of these sounds conceals the lack of parallelism in the apparent symmetry possibly from historical changes within the language. The glides and liquids regularly alternate with vowels in Sanskrit, for example, i ≈ y; u ≈ ʋ ([w]); r̥ ≈ r ; l̥ ≈ l, states Jamison. Sanskrit had a series of retroflex stops. All the retroflexes in Sanskrit are in "origin conditioned alternants of dentals, though from the beginning of the language they have a qualified independence", states Jamison. The palatals are affricates in Sanskrit, not stops. The palatal nasal is a conditioned variant of n occurring next to palatal obstruents. The anusvara that Sanskrit deploys is a conditioned alternant of postvocalic nasals, under certain sandhi conditions. Its visarga is a word-final or morpheme-final conditioned alternant of s and r under certain sandhi conditions. [The] order of Sanskrit sounds works along three principles: it goes from simple to complex; it goes from the back to the front of the mouth; and it groups similar sounds together. (...) Among themselves, both the vowels and consonants are ordered according to where in the mouth they are pronounced, going from back to front. The voiceless aspirated series is also an innovation in Sanskrit but is significantly rarer than the other three series. While the Sanskrit language organizes sounds for expression beyond those found in the PIE language, it retained many features found in the Iranian and Balto-Slavic languages. An example of a similar process in all three, states Jamison, is the retroflex sibilant ʂ being the automatic product of dental s following i, u, r, and k (mnemonically "ruki"). Sanskrit deploys extensive phonological alternations on different linguistic levels through sandhi rules (literally, the rules of "putting together, union, connection, alliance"). This is similar to the English alteration of "going to" as gonna, states Jamison. The Sanskrit language accepts such alterations within it, but offers formal rules for the sandhi of any two words next to each other in the same sentence or linking two sentences. The external sandhi rules state that similar short vowels coalesce into a single long vowel, while dissimilar vowels form glides or undergo diphthongization. Among the consonants, most external sandhi rules recommend regressive assimilation for clarity when they are voiced. According to Jamison, these rules ordinarily apply at compound seams and morpheme boundaries. In Vedic Sanskrit, the external sandhi rules are more variable than in Classical Sanskrit. The internal sandhi rules are more intricate and account for the root and the canonical structure of the Sanskrit word. These rules anticipate what are now known as the Bartholomae's law and Grassmann's law. For example, states Jamison, the "voiceless, voiced, and voiced aspirated obstruents of a positional series regularly alternate with each other (p ≈ b ≈ bʰ; t ≈ d ≈ dʰ, etc. ; note, however, c ≈ j ≈ h), such that, for example, a morpheme with an underlying voiced aspirate final may show alternants[clarification needed] with all three stops under differing internal sandhi conditions". The velar series (k, g, gʰ) alternate with the palatal series (c, j, h), while the structural position of the palatal series is modified into a retroflex cluster when followed by dental. This rule create two morphophonemically distinct series from a single palatal series. Vocalic alternations in the Sanskrit morphological system is termed "strengthening", and called guna and vriddhi in the preconsonantal versions. There is an equivalence to terms deployed in Indo-European descriptive grammars, wherein Sanskrit's unstrengthened state is same as the zero-grade, guna corresponds to normal-grade, while vriddhi is same as the lengthened-state. The qualitative ablaut is not found in Sanskrit just like it is absent in Iranian, but Sanskrit retains quantitative ablaut through vowel strengthening. The transformations between unstrengthened to guna is prominent in the morphological system, states Jamison, while vriddhi is a particularly significant rule when adjectives of origin and appurtenance are derived. The manner in which this is done slightly differs between the Vedic and the Classical Sanskrit. Sanskrit grants a very flexible syllable structure, where they may begin or end with vowels, be single consonants or clusters. Similarly, the syllable may have an internal vowel of any weight. The Vedic Sanskrit shows traces of following the Sievers-Edgerton Law, but Classical Sanskrit doesn't. Vedic Sanskrit has a pitch accent system, states Jamison, which were acknowledged by Panini, but in his Classical Sanskrit the accents disappear. Most Vedic Sanskrit words have one accent. However, this accent is not phonologically predictable, states Jamison. It can fall anywhere in the word and its position often conveys morphological and syntactic information. According to Masica, the presence of an accent system in Vedic Sanskrit is evidenced from the markings in the Vedic texts. This is important because of Sanskrit's connection to the PIE languages and comparative Indo-European linguistics. Sanskrit, like most early Indo-European languages, lost the so-called "laryngeal consonants (cover-symbol ∗H) present in the Proto-Indo-European", states Jamison. This significantly impacted the evolutionary path of the Sanskrit phonology and morphology, particularly in the variant forms of roots. Because Sanskrit is not anyone's native language, it does not have a fixed pronunciation. People tend to pronounce it as they do their native language. The articles on Hindustani, Marathi, Nepali, Oriya and Bengali phonology will give some indication of the variation that is encountered. When Sanskrit was a spoken language, its pronunciation varied regionally and also over time. Nonetheless, Panini described the sound system of Sanskrit well enough that people have a fairly good idea of what he intended. The basis of Sanskrit morphology is the root, states Jamison, "a morpheme bearing lexical meaning". The verbal and nominal stems of Sanskrit words are derived from this root through the phonological vowel-gradation processes, the addition of affixes, verbal and nominal stems. It then adds an ending to establish the grammatical and syntactic identity of the stem. According to Jamison, the "three major formal elements of the morphology are (i) root, (ii) affix, and (iii) ending; and they are roughly responsible for (i) lexical meaning, (ii) derivation, and (iii) inflection respectively". The root structure has certain phonological constraints. Two of the most important constraints of a "root" is that it does not end in a short "a" (अ) and that it is monosyllabic. In contrast, the affixes and endings commonly do. The affixes in Sanskrit are almost always suffixes, with exceptions such as the augment "a-" added as prefix to past tense verb forms and the "-na/n-" infix in single verbal present class, states Jamison. Both verbs and nouns in Sanskrit are either thematic or athematic, states Jamison. Guna (strengthened) forms in the active singular regularly alternate in athematic verbs. The finite verbs of Classical Sanskrit have the following grammatical categories: person, number, voice, tense-aspect, and mood. According to Jamison, a portmanteau morpheme generally expresses the person-number-voice in Sanskrit, and sometimes also the ending or only the ending. The mood of the word is embedded in the affix. These elements of word architecture are the typical building blocks in Classical Sanskrit, but in Vedic Sanskrit these elements fluctuate and are unclear. For example, in the Rigveda preverbs regularly occur in tmesis, states Jamison, which means they are "separated from the finite verb". This indecisiveness is likely linked to Vedic Sanskrit's attempt to incorporate accent. With nonfinite forms of the verb and with nominal derivatives thereof, states Jamison, "preverbs show much clearer univerbation in Vedic, both by position and by accent, and by Classical Sanskrit, tmesis is no longer possible even with finite forms". While roots are typical in Sanskrit, some words do not follow the canonical structure. A few forms lack both inflection and root. Many words are inflected (and can enter into derivation) but lack a recognizable root. Examples from the basic vocabulary include kinship terms such as mātar- (mother), nas- (nose), śvan- (dog). According to Jamison, pronouns and some words outside the semantic categories also lack roots, as do the numerals. Similarly, the Sanskrit language is flexible enough to not mandate inflection. The Sanskrit words can contain more than one affix that interact with each other. Affixes in Sanskrit can be athematic as well as thematic, according to Jamison. Athematic affixes can be alternating. Sanskrit deploys eight cases, namely nominative, accusative, instrumental, dative, ablative, genitive, locative, vocative. Stems, that is "root + affix", appear in two categories in Sanskrit: vowel stems and consonant stems. Unlike some Indo-European languages such as Latin or Greek, according to Jamison, "Sanskrit has no closed set of conventionally denoted noun declensions". Sanskrit includes a fairly large set of stem-types. The linguistic interaction of the roots, the phonological segments, lexical items and the grammar for the Classical Sanskrit consist of four Paninian components. These, states Paul Kiparsky, are the Astadhyaayi, a comprehensive system of 4000 grammatical rules, of which a small set are frequently used; Sivasutras, an inventory of anubandhas (markers) that partition phonological segments for efficient abbreviations through the pratyharas technique; Dhatupatha, a list of 2000 verbal roots classified by their morphology and syntactic properties using diacritic markers, a structure that guides its writing systems; and, the Ganapatha, an inventory of word groups, classes of lexical systems. There are peripheral adjuncts to these four, such as the Unadisutras, which focus on irregularly formed derivatives from the roots. Sanskrit morphology is generally studied in two broad fundamental categories: the nominal forms and the verbal forms. These differ in the types of endings and what these endings mark in the grammatical context. Pronouns and nouns share the same grammatical categories, though they may differ in inflection. Verb-based adjectives and participles are not formally distinct from nouns. Adverbs are typically frozen case forms of adjectives, states Jamison, and "nonfinite verbal forms such as infinitives and gerunds also clearly show frozen nominal case endings". The Sanskrit language includes five tenses: present, future, past imperfect, past aorist and past perfect. It outlines three types of voices: active, passive and the middle. The middle is also referred to as the mediopassive, or more formally in Sanskrit as parasmaipada (word for another) and atmanepada (word for oneself). The paradigm for the tense-aspect system in Sanskrit is the three-way contrast between the "present", the "aorist" and the "perfect" architecture. Vedic Sanskrit is more elaborate and had several additional tenses. For example, the Rigveda includes perfect and a marginal pluperfect. Classical Sanskrit simplifies the "present" system down to two tenses, the perfect and the imperfect, while the "aorist" stems retain the aorist tense and the "perfect" stems retain the perfect and marginal pluperfect. The classical version of the language has elaborate rules for both voice and the tense-apsect system to emphasize clarity, and this is more elaborate than other Indo-European languages. The evolution of these systems can be seen from the earliest layers of the Vedic literature to the late Vedic literature. Sanskrit recognizes three numbers – singular, dual, and plural. The dual is a fully functioning category, used beyond naturally paired objects such as hands or eyes, extending to any collection of two. The elliptical dual is notable in the Vedic Sanskrit, according to Jamison, where a noun in the dual signals a paired opposition. Illustrations include dyāvā (literally, "the two heavens" for heaven-and-earth), mātarā (literally, "the two mothers" for mother-and-father). A verb may be singular, dual or plural, while the person recognized in the language are forms of "I", "you", "he/she/it", "we" and "they". There are three persons in Sanskrit: first, second and third. Sanskrit uses the 3x3 grid formed by the three numbers and the three persons parameters as the paradigm and the basic building block of its verbal system. The Sanskrit language incorporates three genders: feminine, masculine and neuter. All nouns have inherent gender, but with some exceptions, personal pronouns have no gender. Exceptions include demonstrative and anaphoric pronouns. Derivation of a word is used to express the feminine. Two most common derivations come from feminine-forming suffixes, the -ā- (आ, Rādhā) and -ī- (ई, Rukmīnī). The masculine and neuter are much simpler, and the difference between them is primarily inflectional. Similar affixes for the feminine are found in many Indo-European languages, states Burrow, suggesting links of the Sanskrit to its PIE heritage. Pronouns in Sanskrit include the personal pronouns of the first and second persons, unmarked for gender, and a larger number of gender-distinguishing pronouns and adjectives. Examples of the former include ahám (first singular), vayám (first plural) and yūyám (second plural). The latter can be demonstrative, deictic or anaphoric. Both the Vedic and Classical Sanskrit share the sá/tám pronominal stem, and this is the closest element to a third person pronoun and an article in the Sanskrit language, states Jamison. Indicative, potential and imperative are the three mood forms in Sanskrit. The Sanskrit language formally incorporates poetic metres. By the late Vedic era, this developed into a field of study and it was central to the composition of the Hindu literature including the later Vedic texts. This study of Sanskrit prosody is called chandas and considered as one of the six Vedangas, or limbs of Vedic studies. Sanskrit metres include those based on a fixed number of syllables per verse, and those based on fixed number of morae per verse. The Vedic Sanskrit employs fifteen metres, of which seven are common, and the most frequent are three (8-, 11- and 12-syllable lines). The Classical Sanskrit deploys both linear and non-linear metres, many of which are based on syllables and others based on diligently crafted verses based on repeating numbers of morae (matra per foot). nor is there any meter without words. The meter-feature of the Sanskrit language embeds another layer of communication to the listener or reader. A change in metres has been a tool of literary architecture and an embedded code to inform the reciter and audience that it marks the end of a section or chapter. Each section or chapter of these texts uses identical metres, rhythmically presenting their ideas and making it easier to remember, recall and check for accuracy. Authors coded a hymn's end by frequently using a verse of a metre different than that used in the hymn's body. However, Hindu tradition does not use the Gayatri metre to end a hymn or composition, possibly because it has enjoyed a special level of reverence in Hinduism. One of the oldest surviving Sanskrit manuscript page in Gupta script (~828 CE), discovered in Nepal. The early history of writing Sanskrit and other languages in ancient India is a problematic topic despite a century of scholarship, states Richard Salomon – an epigraphist and Indologist specializing in Sanskrit and Pali literature. The earliest script from the Indian subcontinent is from the Indus Valley Civilization (3rd/2nd millennium BCE), but this script remains undeciphered. Of the Vedic period that appeared after the Indus Valley Civilization, if any scripts for Vedic Sanskrit existed, they have not survived. Scholars generally accept that Sanskrit originated in an oral society, and that an oral tradition preserved the extensive Vedic and Classical Sanskrit literature. Other scholars such as Jack Goody state that the Vedic Sanskrit texts are not the product of an oral society, basing this view by comparing inconsistencies in the transmitted versions of literature from various oral societies such as the Greek, Serbian, and other cultures, then noting that the Vedic literature is too consistent and vast to have been composed and transmitted orally across generations, without being written down. Sanskrit is written very precisely, states Ruppel. For every sound, it has one sign only, and each Sanskrit sign always represents the same sound. This phonetic aspect of Sanskrit distinguishes it from many of the world's languages. [note 28] The basic graphic unit of Sanskrit is the aksara, or syllable. All consonants are equal in Sanskrit and it does not have capital and small letters, such as the "A" and "a" in English. However, vowels do not have an independent status in Sanskrit, unlike English and several other Indo-European languages. In Sanskrit, vowels co-exist with the consonants in order to achieve phonetic clarity. The Vedic Sanskrit hymn II.2.4 of the Aitereya Aranyaka explains the consonants to be the body of a verse, the vowels to be its soul (voice), and the sibilants as its breath. This intimate relationship between the vowels and the consonants are embedded in the numerous writing scripts for the Sanskrit language. One of the oldest Hindu Sanskrit[note 29] inscriptions, the broken pieces of this early 1st-century BCE Hathibada Brahmi Inscription were discovered in Rajasthan. It is a dedication to deities Vasudeva-Samkarshana (Krishna-Balarama) and mentions a stone temple. The Brahmi script for writing Sanskrit is a "modified consonant-syllabic" script. The graphic syllable is its basic unit, and this consists of a consonant with or without diacritic modifications. Since the vowel is an integral part of the consonants, and given the efficiently compacted, fused consonant cluster morphology for Sanskrit words and grammar, the Brahmi and its derivative writing systems deploy ligatures, diacritics and relative positioning of the vowel to inform the reader how the vowel is related to the consonant and how it is expected to be pronounced for clarity. [note 30] This feature of Brahmi and its modern Indic script derivatives makes it difficult to classify it under the main script types used for the writing systems for most of the world's languages, namely logographic, syllabic and alphabetic. The Brahmi script evolved into "a vast number of forms and derivatives", states Richard Salomon, and in theory, Sanskrit "can be represented in virtually any of the main Brahmi-based scripts and in practice it often is". Sanskrit does not have a native script. Being a phonetic language, it can be written in any precise script that efficiently maps unique human sounds to unique symbols. From the ancient times, it has been written in numerous regional scripts in South and Southeast Asia. Most of these are descendants of the Brahmi script. The earliest datable varnamala Brahmi alphabet system, found in later Sanskrit texts, is from the 2nd-century BCE, in the form of terracotta plaques found in Haryana. It shows a "schoolboy's writing lessons", states Salomon. Many modern era manuscripts are written and available in the Nagari script, whose form is attestable to the 1st millennium CE. The Nagari script is the ancestor of Devanagari (north India), Nandinagari (south India) and other variants. The Nāgarī script was in regular use by 7th century CE, and had fully evolved into Devanagari and Nandinagari scripts by about the end of the first millennium of the common era. The Devanagari script, states Banerji, became more popular for Sanskrit in India since about the 18th-century. However, Sanskrit does have special historical connection to the Nagari script as attested by the epigraphical evidence. The Nagari script has been thought as a north Indian script for Sanskrit as well as the regional languages such as Hindi, Marathi and Nepali. However, it has had a "supra-local" status as evidenced by 1st-millennium CE epigraphy and manuscripts discovered all over India and as far as Sri Lanka, Burma, Indonesia and in its parent form called the Siddhamatrka script found in manuscripts of East Asia. The Sanskrit and Balinese languages Sanur inscription on Belanjong pillar of Bali (Indonesia), dated to about 914 CE, is in part in the Nagari script. The Nagari script used for Classical Sanskrit has the fullest repertoire of characters consisting of fourteen vowels and thirty three consonants. For the Vedic Sanskrit, it has two more allophonic consonantal characters (the intervocalic ळ ḷa, and ळ्ह ḷha). To communicate phonetic accuracy, it also includes several modifiers such as the anusvara dot and the visarga double dot, punctuation symbols and others such as the halanta sign. Other scripts such as Gujarati, Bangla, Odia and major south Indian scripts, states Salomon, "have been and often still are used in their proper territories for writing Sanskrit". These and many Indian scripts look different to the untrained eye, but the differences between Indic scripts is "mostly superficial and they share the same phonetic repertoire and systemic features", states Salomon. They all have essentially the same set of eleven to fourteen vowels and thirty-three consonants as established by the Sanskrit language and attestable in the Brahmi script. Further, a closer examination reveals that they all have the similar basic graphic principles, the same varnamala (literally, "garland of letters") alphabetic ordering following the same logical phonetic order, easing the work of historic skilled scribes writing or reproducing Sanskrit works across the Indian subcontinent. [note 31] The Sanskrit language written in some Indic scripts exaggerate angles or round shapes, but this serves only to mask the underlying similarities. Nagari script favours symmetry set with squared outlines and right angles. In contrast, Sanskrit written in the Bangla script emphasizes the acute angles while the neighbouring Odia script emphasizes rounded shapes and uses cosmetically appealing "umbrella-like curves" above the script symbols. In the south, where Dravidian languages predominate, scripts used for Sanskrit include the Kannada, Telugu, Malayalam and Grantha alphabets. The earliest known stone inscriptions in Sanskrit are in the Brahmi script from the first century BCE. [note 32][note 33] These include the Ayodhyā (Uttar Pradesh) and Hāthībādā-Ghosuṇḍī (near Chittorgarh, Rajasthan) inscriptions. Both of these, states Salomon, are "essentially standard" and "correct Sanskrit", with a few exceptions reflecting an "informal Sanskrit usage". Other important Hindu inscriptions dated to the last centuries of the 1st millennium BCE, in relatively accurate classical Sanskrit and Brahmi script are the Yavanarajya inscription on a red sandstone slab and the long Naneghat inscription on the wall of a cave rest stop in the Western Ghats. Besides these few examples from the 1st century BCE, the earliest Sanskrit and hybrid dialect inscriptions are found in Mathura (Uttar Pradesh). These date to the 1st and 2nd-century CE, states Salomon, from the time of the Saka Ksatrapas of the early Kushan Empire. [note 34] These are also in the Brahmi script. The earliest of these, states Salomon, are attributed to Ksatrapa Sodasa from the early years of 1st-century CE. Of the Mathura inscriptions, the most significant is the Mora Well Inscription. In a manner similar to the Hathibada inscription, the Mora well inscription is a dedication inscription and is linked to the Vaishnavism tradition of Hinduism. It mentions a stone shrine (temple), pratima (murti, images) and calls the five Vrishnis as bhagavatam. There are many other Mathura Sanskrit inscriptions in Brahmi script overlapping the era of Indo-Scythian Northern Satraps and early Kushanas. Other significant 1st-century inscriptions in reasonably good classical Sanskrit in the Brahmi script include the Vasu Doorjamb Inscription and the Mountain Temple inscription. The early ones are related to the Brahmanical, except for the inscription from Kankali Tila which may be Jaina, but none are Buddhist. A few of the later inscriptions from the 2nd-century CE include Buddhist Sanskrit, while others are in "more or less" standard Sanskrit and related to the Brahmanical tradition. In Maharashtra and Gujarat, Brahmi script Sanskrit inscriptions from the early centuries of the common era exist at the Nasik Caves site, near the Girnar mountain of Junagadh and elsewhere such as at Kanakhera, Kanheri, and Gunda. The Nasik inscription dates to the mid 1st century CE, is a fair approximation of standard Sanskrit and has hybrid features. The Junagadh rock inscription of Western Satraps ruler Rudradaman I (c. 150 CE, Gujarat) is the first long poetic-style inscription in "more or less" standard Sanskrit that has survived into the modern era. It represents a turning point in the history of Sanskrit epigraphy, states Salomon. [note 35] Though no similar inscriptions are found for about two hundred years after the Rudradaman reign, it is important because its style is the prototype of the eulogy-style Sanskrit inscriptions found in the Gupta Empire era. These inscriptions are also in the Brahmi script. The Nagarjunakonda inscriptions are the earliest known substantial South Indian Sanskrit inscriptions, probably from the late 3rd-century or early 4th-century CE, or both. These inscriptions are related to Buddhism and the Shaivism tradition of Hinduism. A few of these inscriptions from both traditions are verse-style in the classical Sanskrit language, while some such as the pillar inscription is written in prose and a hybridized Sanskrit language. An earlier hybrid Sanskrit inscription found on Amaravati slab is dated to the late 2nd-century, while a few later ones include Sanskrit inscriptions along with Prakrit inscriptions related to Hinduism and Buddhism. After the 3rd-century CE, Sanskrit inscriptions dominate and many have survived. Between the 4th and 7th-century CE, south Indian inscriptions are exclusively in the Sanskrit language. In the eastern regions of the Indian subcontinent, scholars report minor Sanskrit inscriptions from the 2nd-century, these being fragments and scattered. The earliest substantial true Sanskrit language inscription of Susuniya (West Bengal) is dated to the 4th-century. Elsewhere, such as Dehradun (Uttarakhand), inscriptions in more or less correct classical Sanskrit inscriptions are dated to the 3rd-century. The evidence of the use of the Sanskrit language in Indic writing systems appears in southeast Asia in the first half of the 1st-millennium CE. A few of these in Vietnam are bilingual where both the Sanskrit and the local language is written in the Indian alphabet. Early Sanskrit language inscriptions in Indic writing systems are dated to the 4th-century in Malaysia, 5th to 6th-century in Thailand near Si Thep and the Sak River, early 5th-century in Kutai (east Borneo) and mid 5th-century in west Java (Indonesia). Both major writing systems for Sanskrit, the North Indian and South Indian scripts, have been discovered in southeast Asia, but the Southern variety with its rounded shapes are far more common. The Indic scripts, particularly the Pallava script prototype, spread and ultimately evolved into Mon-Burmese, Khmer, Thai, Laos, Sumatran, Celebes, Javanese and Balinese scripts. From about the 5th-century, Sanskrit inscriptions become common in many parts of South Asia and Southeast Asia, with significant discoveries in Nepal, Vietnam and Cambodia. Sanskrit has been written in various scripts on a variety of media such as palm leaves, cloth, paper, rock and metal sheets, from ancient times. 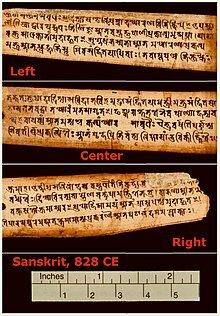 For nearly 2,000 years, Sanskrit was the language of a cultural order that exerted influence across South Asia, Inner Asia, Southeast Asia, and to a certain extent East Asia. A significant form of post-Vedic Sanskrit is found in the Sanskrit of Indian epic poetry—the Ramayana and Mahabharata. The deviations from Pāṇini in the epics are generally considered to be on account of interference from Prakrits, or innovations, and not because they are pre-Paninian. Traditional Sanskrit scholars call such deviations ārṣa (आर्ष), meaning 'of the ṛṣis', the traditional title for the ancient authors. In some contexts, there are also more "prakritisms" (borrowings from common speech) than in Classical Sanskrit proper. Buddhist Hybrid Sanskrit is a literary language heavily influenced by the Middle Indo-Aryan languages, based on early Buddhist Prakrit texts which subsequently assimilated to the Classical Sanskrit standard in varying degrees. Sanskrit has greatly influenced the languages of India that grew from its vocabulary and grammatical base; for instance, Hindi is a "Sanskritised register" of Hindustani. All modern Indo-Aryan languages, as well as Munda and Dravidian languages have borrowed many words either directly from Sanskrit (tatsama words), or indirectly via middle Indo-Aryan languages (tadbhava words). Words originating in Sanskrit are estimated at roughly fifty percent of the vocabulary of modern Indo-Aryan languages, as well as the literary forms of Malayalam and Kannada. Literary texts in Telugu are lexically Sanskrit or Sanskritised to an enormous extent, perhaps seventy percent or more. Marathi is another prominent language in Western India, that derives most of its words and Marathi grammar from Sanskrit. Sanskrit words are often preferred in the literary texts in Marathi over corresponding colloquial Marathi word. Buddhist Sanskrit has had a considerable influence on East Asian languages such as Chinese, state William Wang and Chaofen Sun. Many words have been adopted from Sanskrit into the Chinese, both in its historic religious discourse and everyday use. [note 38] This process likely started about 200 CE and continued through about 1400 CE, with the efforts of monks such as Yuezhi, Anxi, Kangju, Tianzhu, Yan Fodiao, Faxian, Xuanzang and Yijing. Further, as the Chinese language and culture influenced the rest of East Asia, the ideas in Sanskrit texts and some of its linguistic elements migrated further. Sanskrit has also influenced Sino-Tibetan languages, mostly through translations of Buddhist Hybrid Sanskrit. Many terms were transliterated directly and added to the Chinese vocabulary. Chinese words like 剎那 chànà (Devanagari: क्षण kṣaṇa 'instantaneous period') were borrowed from Sanskrit. Many Sanskrit texts survive only in Tibetan collections of commentaries to the Buddhist teachings, the Tengyur. Sanskrit was a language for religious purposes and for the political elite in parts of medieval era Southeast Asia, Central Asia and East Asia. In Southeast Asia, languages such as Thai and Lao contain many loanwords from Sanskrit, as do Khmer. For example, in Thai, Ravana, the emperor of Lanka, is called Thosakanth, a derivation of his Sanskrit name Dāśakaṇṭha "having ten necks". Many Sanskrit loanwords are also found in Austronesian languages, such as Javanese, particularly the older form in which nearly half the vocabulary is borrowed. Other Austronesian languages, such as traditional Malay and modern Indonesian, also derive much of their vocabulary from Sanskrit. 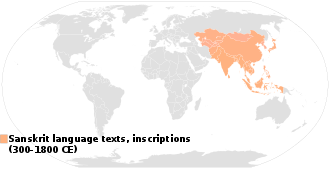 Similarly, Philippine languages such as Tagalog have some Sanskrit loanwords, although more are derived from Spanish. A Sanskrit loanword encountered in many Southeast Asian languages is the word bhāṣā, or spoken language, which is used to refer to the names of many languages. English also has words of Sanskrit origin. Sanskrit has also influenced the religious register of Japanese mostly through transliterations.These were borrowed from Chinese transliterations. In particular, the Shingon (lit. "True Words") sect of esoteric Buddhism has been relying on Sanskrit and original Sanskrit mantras and writings, as a means of realizing Buddhahood. According to the 2001 census of India, 14,135 people had said Sanskrit was their mother tongue. It increased to 24,821 people in the 2011 census of India. Sanskrit has experienced a growth of over 70 per cent in one decade. However, Sanskrit speakers still account for just 0.00198 per cent of India's total population. Sanskrit is the sacred language of various Hindu, Buddhist, and Jain traditions. It is used during worship in Hindu temples. In Newar Buddhism, it is used in all monasteries, while Mahayana and Tibetan Buddhist religious texts and sutras are in Sanskrit as well as vernacular languages. Some of the revered texts of Jainism including the Tattvartha sutra, Ratnakaranda śrāvakācāra, the Bhaktamara Stotra and the Agamas are in Sanskrit. Further, states Paul Dundas, Sanskrit mantras and Sanskrit as a ritual language was commonplace among Jains throughout their medieval history. Many Hindu rituals and rites-of-passage such as the "giving away the bride" and mutual vows at weddings, a baby's naming or first solid food ceremony and the goodbye during a cremation invoke and chant Sanskrit hymns. Major festivals such as the Durga Puja ritually recite entire Sanskrit texts such as the Devi Mahatmya every year particularly amongst the numerous communities of eastern India. In the south, Sanskrit texts are recited at many major Hindu temples such as the Meenakshi Temple. According to Richard H. Davis, a scholar of Religion and South Asian studies, the breadth and variety of oral recitations of the Sanskrit text Bhagavad Gita is remarkable. 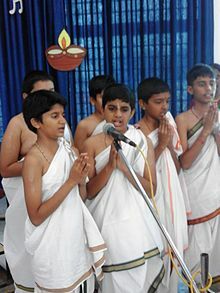 In India and beyond, its recitations include "simple private household readings, to family and neighborhood recitation sessions, to holy men reciting in temples or at pilgrimage places for passersby, to public Gita discourses held almost nightly at halls and auditoriums in every Indian city". Numerous loan Sanskrit words are found in other major Asian languages. For example, Filipino, Cebuano, Lao, Khmer Thai and its alphabets, Malay, Indonesian (old Javanese-English dictionary by P.J. Zoetmulder contains over 25,500 entries), and even in English. 11th-century Nepalese Sanskrit text Devi Mahatmya palm leaf page. 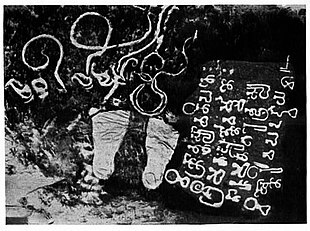 Bhujimol script, which is now extinct. It is related to Devanagari, Kutila and Newari scripts. Sanskrit is one the 15 languages of the Eighth Schedule to the Constitution of India. A number of colleges and universities in India have dedicated departments for Sanskrit studies. The 18th- and 19th-century speculations about the possible links of Sanskrit to ancient Egyptian language were later proven to be wrong, but it fed an orientalist discourse both in the form Indophobia and Indophilia, states Trautmann. Sanskrit writings, when first discovered, were imagined by Indophiles to potentially be "repositories of the primitive experiences and religion of the human race, and as such confirmatory of the truth of Christian scripture", as well as a key to "universal ethnological narrative". The Indophobes imagined the opposite, making the counterclaim that there is little of any value in Sanskrit, portraying it as "a language fabricated by artful [Brahmin] priests", with little original thought, possibly copied from the Greeks who came with Alexander or perhaps the Persians. Scholars such as William Jones and his colleagues felt the need for systematic studies of Sanskrit language and literature. This launched the Asiatic Society, an idea that was soon transplanted to Europe starting with the efforts of Henry Thomas Colebrooke in Britain, then Alexander Hamilton who helped expand its studies to Paris and thereafter his student Friedrich Schlegel who introduced Sanskrit to the universities of Germany. Schlegel nurtured his own students into influential European Sanskrit scholars, particularly through Franz Bopp and Friedrich Max Muller. As these scholars translated the Sanskrit manuscripts, the enthusiasm for Sanskrit grew rapidly among European scholars, states Trautmann, and chairs for Sanskrit "were established in the universities of nearly every German statelet" creating a competition for Sanskrit experts. India: Satyameva Jayate (सत्यमेव जयते) meaning: Truth alone triumphs. Nepal: Janani Janmabhūmischa Swargādapi Garīyasī meaning: Mother and motherland are superior to heaven. Indonesia: In Indonesia, Sanskrit are usually widely used as terms and mottoes of the armed forces and other national organizations (See: Indonesian Armed Forces mottoes). Rashhtra Sewakottama (राष्ट्र सेवकोत्तम; People's Main Servants) is the official motto of the Indonesian National Police, Tri Dharma Eka Karma (त्रिधर्म एक कर्म) is the official motto of the Indonesian Military, Kartika Eka Pakshhi (कार्तिक एक पक्षी; Unmatchable Bird with Noble Goals) is the official motto of the Indonesian Army, Adheetakarya Mahatvaveerya Nagarabhakti (अधीतकार्य महत्ववीर्य नगरभक्ति; "Hard-working Knights Serving Bravery as Nations Hero") is the official motto of the Indonesian Military Academy, Upakriya Labdha Prayojana Balottama (उपक्रिया लब्ध प्रयोजन बालोत्तम; "Purpose of The Unit is to Give The Best Service to The Nation by Finding The Perfect Soldier") is the official motto of the Army Psychological Corps, Karmanyevaadhikarasté Maaphaléshhu Kadaachana (कर्मण्येवाधिकारस्ते मा फलेषु कदाचन; "Working Without Counting The Profit and Loss") is the official motto of the Air-Force Special Forces (Paskhas), Jaléshhu Bhūmyamcha Jayamahé (जलेषु भूम्यम्च जयमहे; "On The Sea and Land We Are Glorious") is the official motto of the Indonesian Marine Corps, and there are more units and organizations in Indonesia either Armed Forces or civil which use the Sanskrit language respectively as their mottoes and other purposes. ^ The Old Hittite language and Mycenaean Greek, along with the Sanskrit language, are the oldest documented IE languages; of these, Old Hittite is dated to be the oldest. ^ The oldest documented South Asian language is not Sanskrit however. It is the language evidenced by the undeciphered Harappan script from the 3rd millennium BCE. ^ More numerous inscribed Sanskrit records in Brahmi have been found near Mathura and elsewhere, but these are from the 1st century CE onwards. Indian texts in Sanskrit were already in China by 402 CE, carried by the influential Buddhist pilgrim Faxian, who translated them into Chinese by 418 CE. ^ The Mitanni treaty is generally dated to the 16th-century BCE, but this date and its significance remains much debated. ^ An example of the shared phrasal equations is the dyaus pita in Vedic Sanskrit, which means "father Heaven". The Mycenaean Greek equivalent is Zeus Pater, which evolved to Jupiter in Latin. Equivalent "paternal Heaven" phrasal equation is found in many Indo-European languages. ^ Pāṇini's use of the term lipi has been a source of scholarly disagreements. Harry Falk in his 1993 overview states that ancient Indians neither knew nor used writing script, and Pāṇini's mention is likely a reference to Semitic and Greek scripts. In his 1995 review, Salomon questions Falk's arguments and writes it is "speculative at best and hardly constitutes firm grounds for a late date for Kharoṣṭhī. The stronger argument for this position is that we have no specimen of the script before the time of Ashoka, nor any direct evidence of intermediate stages in its development; but of course this does not mean that such earlier forms did not exist, only that, if they did exist, they have not survived, presumably because they were not employed for monumental purposes before Ashoka". According to Hartmut Scharfe, Lipi of Pāṇini may be borrowed from the Old Persian Dipi, in turn derived from Sumerian Dup. Scharfe adds that the best evidence, at the time of his review, is that no script was used in India, aside from the Northwest Indian subcontinent, before around 300 BCE because Indian tradition "at every occasion stresses the orality of the cultural and literary heritage." Kenneth Norman states writing scripts in ancient India evolved over the long period of time like other cultures, that it is unlikely that ancient Indians developed a single complete writing system at one and the same time in the Maurya era. It is even less likely, states Norman, that a writing script was invented during Ashoka's rule, starting from nothing, for the specific purpose of writing his inscriptions and then it was understood all over South Asia where the Ashoka pillars are found. Jack Goody states that ancient India likely had a "very old culture of writing" along with its oral tradition of composing and transmitting knowledge, because the Vedic literature is too vast, consistent and complex to have been entirely created, memorized, accurately preserved and spread without a written system. Falk disagrees with Goody, and suggests that it is a Western presumption and inability to imagine that remarkably early scientific achievements such as Pāṇini's grammar (5th to 4th century BCE), and the creation, preservation and wide distribution of the large corpus of the Brahmanic Vedic literature and the Buddhist canonical literature, without any writing scripts. Johannes Bronkhorst disagrees with Falk, and states, "Falk goes too far. It is fair to expect that we believe that Vedic memorisation — though without parallel in any other human society — has been able to preserve very long texts for many centuries without losing a syllable. (...) However, the oral composition of a work as complex as Pāṇini's grammar is not only without parallel in other human cultures, it is without parallel in India itself. (...) It just will not do to state that our difficulty in conceiving any such thing is our problem". ^ Scholars have variously dated the Ramayana from about 750 BCE to 300 CE, the wide range depending on whether the estimate is for the earliest version or for the versions that have survived into the modern era. According to Sanskrit epics scholar John Brockington, the earliest layer of the Ramayana epic was composed about the 5th to the 4th-century BCE. Other recent scholarly estimates are around the 4th-century BCE, give or take a century. ^ Pali is also an extinct language. ^ A celebrated work on the philosophy of language is the Vakyapadiya by the 5th-century Hindu scholar Bhartrhari. ^ The oldest surviving Sanskrit inscription in the Kathmandu valley is dated to 464 CE. ^ India is linguistically diverse. Its 2001 census report listed 122 languages and their use, while the raw data returned 1,635 "rationalized mother languages" and 1,937 unclassified 'other' mother tongues. ^ Sanskrit is written in many scripts. Sounds in grey are not phonemic. ^ The "root + affix" is called the "stem". ^ Other equivalents: bharāmi (I carry), bharati (he carries), bharāmas (we carry). Similar morphology is found in some other Indo-European languages; for example, in the Gothic language, baira (I carry), bairis (you carry), bairiþ (he carries). ^ Ruppel gives the following endings for the "present indicative active" in the Sanskrit language: 1st dual: -vaḥ, 1st plural: -maḥ, 2nd dual: -thaḥ, 2nd plural: -tha and so on. ^ The Sanskrit in the Indian epics such as the Mahabharata and the Ramayana are all in meter, and the structure of the metrics has attracted scholarly studies since the 19th-century. ^ Kena, Katha, Isha, Shvetashvatara and Mundaka Upanishads are examples of verse-style ancient Upanishads. ^ Sudden or significant changes in metre, wherein the metre of succeeding sections return to earlier sections, suggest a corruption of the message, interpolations and insertion of text into a Sanskrit manuscript. It may also reflect that the text is a compilation of works of different authors and time periods. ^ A version of this list of sixty-four ancient Indian scripts is found in the Chinese translation of an Indian Buddhist text, and this translation has been dated to 308 CE. ^ The Buddhist text Lalitavistara Sūtra describes the young Siddhartha – the future Buddha – to have mastered philology and scripts at a school from Brahmin Lipikara and Deva Vidyasinha. The Buddhist texts list the sixty four lipi that the Buddha knew as a child, with the Brahmi script topping the list. "The historical value of this list is however limited by several factors", states Salomon. The list may be a later interpolation. [note 23] The Jain canonical texts such as the Pannavana Sutta – probably older than the Buddhist texts – list eighteen writing systems, with the Brahmi topping the list and Kharotthi (Kharoshthi) listed as fourth. The Jaina text elsewhere states that the "Brahmi is written in 18 different forms", but the details are lacking. ^ The Greek Nearchos who visited ancient India with the army of Alexander the Great in the 4th-century BCE, mentions that Indians wrote on cloth, but Nearchos could have confused Aramaic writers with the Indians. ^ Salomon writes, in The World's Writing Systems edited by Peter Daniels, that "many scholars feel that the origins of these scripts must have gone back further than this [mid-3rd century BCE Ashoka inscriptions], but there is no conclusive proof". ^ Minor inscriptions discovered in the 20th-century may be older, but their dating is uncertain. ^ Sanskrit differs in this aspect from English, another Indo-European language. English has many ways of pronouncing the same letters. Ruppel gives the example of ough and the different ways it is pronounced in thorough, through and tough. English also represents the same sound with different letters. Ruppel gives the example of ea as in meal, thief , see and receive. This is not the case with Sanskrit, a language where unique sounds are precisely mapped to unique letters. ^ Salomon states that the inscription has a few scribal errors, but is essentially standard Sanskrit. ^ Salomon illustrates this for the consonant ka which is written as "
" in the Brahmi script and "क" in the Devanagari script, the vowel is marked together with the consonant before as in "कि", after "का", above "के" or below "कृ". ^ Salomon states that these shared graphic principles that combine syllabic and alphabetic writing are distinctive for Indic scripts when contrasted with other major world languages. The only known similarity is found in the Ethiopic scripts, but Ethiopic system lacks clusters and the Indic set of full vowels signs. ^ Some scholars date these to the 2nd century BCE. ^ Prakrit inscriptions of ancient India, such as those of Ashoka, are older. Louis Renou called it "the great linguistical paradox of India" that the Sanskrit inscriptions appear later than Prakrit inscriptions, although Prakrit is considered as a descendant of the Sanskrit language. ^ According to Salomon, towards the end of pre-Christian era, "a smattering" of standard or nearly standard Sanskrit inscriptions came into vogue, and "we may assume that these are isolated survivals of what must have been then an increasingly common practice". He adds, that the Scythian rulers of northern and western India while not the originators, were promoters of the use of Sanskrit language for inscriptions, and "their motivation in promoting Sanskrit was presumably a desire to establish themselves as legitimate Indian or at least Indianized rulers and to curry the favor of the educated Brahmanical elite". ^ The Rudradaman inscription is "not pure classical Sanskrit", but with few epic-vernacular Sanskrit exceptions, it approaches high classical Sanskrit. ^ The use of the Sanskrit language in epigraphy gradually dropped after the arrival and the consolidation of Islamic Delhi Sultanate rule in the late 12th-century, but it remained in active epigraphical use in the south and central regions of India. By about the 14th-century, with the Islamic armies conquering more of the Indian subcontinent, the use of Sanskrit language for inscriptions became rarer and it was replaced with Persian, Arabic, Dravidian and North-Indo-Aryan languages, states Salomon. The Sanskrit language, particularly in bilingual formet, re-emerged in the epigraphy of Hindu kingdoms such as the Vijayanagara, Yadavas, Hoysalas, Pandyas and others that re-established themselves. Some Muslim rulers such as Adil Shah also issued Sanskrit language inscriptions recording the donation of a mosque. ^ Most Tripitaka historic texts in the Pali language, but Sanskrit Tripitaka texts have been discovered. ^ Examples of phonetically imported Sanskrit words in Chinese include samgha (Chinese: seng), bhiksuni (ni), kasaya (jiasha), namo or namas (namo), and nirvana (niepan). The list of phonetically transcribed and semantically translated words from Sanskrit into Chinese is substantial, states Xiangdong Shi. ^ Uta Reinöhl (2016). Grammaticalization and the Rise of Configurationality in Indo-Aryan. Oxford University Press. pp. xiv, 1–16. ISBN 978-0-19-873666-0. ^ Hammarström, Harald; Forkel, Robert; Haspelmath, Martin, eds. (2017). "Sanskrit". Glottolog 3.0. Jena, Germany: Max Planck Institute for the Science of Human History. ^ a b c d e George Cardona (2012). Sanskrit Language. Encyclopaedia Britannica. ^ Tim Murray 2007, pp. v-vi, 1-18, 31-32, 115–116. ^ a b Harold G. Coward 1990, pp. 3-12, 36-47, 111-112, Note: Sanskrit was both a literary and spoken language in ancient India..
^ Damien Keown & Charles S. Prebish 2013, p. 15, Quote: "Sanskrit served as the lingua franca of ancient India, just as Latin did in medieval Europe". ^ a b c d e Deshpande 2011, pp. 218-220. ^ A. M. Ruppel 2017, pp. 1–2, 102–104. ^ a b Ramesh Chandra Majumdar 1974, pp. 1–4. ^ a b Charles Orzech; Henrik Sørensen; Richard Payne (2011). Esoteric Buddhism and the Tantras in East Asia. BRILL Academic. pp. 985–996. ISBN 978-90-04-18491-6. ; Upendra Thakur (1992). India and Japan, a Study in Interaction During 5th Cent.-14th Cent. A.D. Abhinav Publications. pp. 53–61. ISBN 978-81-7017-289-5. ^ a b Banerji 1989, pp. 595–596. ^ Michael C. Howard 2012, p. 21, Quote: "Sanskrit was another important lingua franca in the ancient world that was widely used in South Asia and in the context of Hindu and Buddhist religions in neighboring areas as well. (...) The spread of South Asian cultural influence to Southeast Asia, meant that Sanskrit was also used in these areas, especially in a religious context and political elites.". ^ Sheldon Pollock 2009, p. 14, Quote: "Once Sanskrit emerged from the sacerdotal environment ... it became the sole medium by which ruling elites expressed their power ... Sanskrit probably never functioned as an everyday medium of communication anywhere in the cosmopolis—not in South Asia itself, let alone Southeast Asia ... The work Sanskrit did do ... was directed above all toward articulating a form of ... politics ... as celebration of aesthetic power.". ^ Philipp Strazny 2013, p. 500. ^ a b c Roger D. Woodard (2008). The Ancient Languages of Asia and the Americas. Cambridge University Press. pp. 1–2. ISBN 978-0-521-68494-1. , Quote: "The earliest form of this 'oldest' language, Sanskrit, is the one found in the ancient Brahmanic text called the Rigveda, composed c. 1500 BC. The date makes Sanskrit one of the three earliest of the well-documented languages of the Indo-European family - the other two being Old Hittite and Myceanaean Greek - and, in keeping with its early appearance, Sanskrit has been a cornerstone in the reconstruction of the parent language of the Indo-European family - Proto-Indo-European." ^ Arne Hult (1991). On the Development of the Present Active Participle in Bulgarian. Institutum Slavicum Universitatis Gothoburgensis. p. 26. ISBN 978-91-86094-11-9. ^ Benware 1974, pp. 25–27. ^ Thomas Burrow 2001, pp. v & ch. 1. ^ a b Alfred C. Woolner (1986). Introduction to Prakrit. Motilal Banarsidass. pp. 3–4. ISBN 978-81-208-0189-9. , Quote:"If in 'Sanskrit' we include the Vedic language and all dialects of the Old Indian period, then it is true to say that all the Prakrits are derived from Sanskrit. If on the other hand 'Sanskrit' is used more strictly of the Panini-Patanjali language or 'Classical Sanskrit,' then it is untrue to say that any Prakrit is derived from Sanskrit, except that Sauraseni, the Midland Prakrit, is derived from the Old Indian dialect of the Madhyadesa on which Classical Sanskrit was mainly based." ^ a b William Bright (2014). American Indian Linguistics and Literature. Walter De Gruyter. pp. 16–17. ISBN 978-3-11-086311-6. ^ a b Cynthia Groff (2017). The Ecology of Language in Multilingual India: Voices of Women and Educators in the Himalayan Foothills. Palgrave Macmillan UK. pp. 183–185. ISBN 978-1-137-51961-0. ^ a b Iswari P. Pandey (2015). South Asian in the Mid-South: Migrations of Literacies. University of Pittsburgh Press. pp. 85–86. ISBN 978-0-8229-8102-2. ^ Filliozat 2004, pp. 360–375. ^ a b c d e f g h Salomon 1998, pp. 86-87. ^ Salomon 1998, pp. 87-89. ^ Henri Arvon. Faxian: Chinese Buddhist Monk. Encyclopaedia Britannica. ^ Robert E. Buswell Jr.; Donald S. Lopez Jr. (2013). The Princeton Dictionary of Buddhism. Princeton University Press. p. 504. ISBN 978-1-4008-4805-8. ^ Reinhold Grünendahl (2001). South Indian Scripts in Sanskrit Manuscripts and Prints: Grantha Tamil, Malayalam, Telugu, Kannada, Nandinagari. Otto Harrassowitz Verlag. pp. xiii–xxii. ISBN 978-3-447-04504-9. ^ Dhanesh Jain; George Cardona (2007). The Indo-Aryan Languages. Routledge. pp. 51–52. ISBN 978-1-135-79711-9. ^ a b Shlomo Biderman 2008, p. 90. ^ Will Durant 1963, p. 406. ^ Sir Monier Monier-Williams (2005). A Sanskrit-English Dictionary: Etymologically and Philologically Arranged with Special Reference to Cognate Indo-European Languages. Motilal Banarsidass. p. 1120. ISBN 978-81-208-3105-6. ^ Louis Renou & Jagbans Kishore Balbir 2004, pp. 1-2. ^ Annette Wilke; Oliver Moebus (2011). Sound and Communication: An Aesthetic Cultural History of Sanskrit Hinduism. Walter de Gruyter. pp. 62–66 with footnotes. ISBN 978-3-11-024003-0. ^ Guy L. Beck 2006, pp. 117–123. ^ Jared Klein; Brian Joseph; Matthias Fritz (2017). Handbook of Comparative and Historical Indo-European Linguistics: An International Handbook. Walter De Gruyter. pp. 318–320. ISBN 978-3-11-026128-8. ^ a b Brigitte L. M. Bauer (2017). Nominal Apposition in Indo-European: Its Forms and Functions, and its Evolution in Latin-Romance. De Gruyter. pp. 90–92, for detailed comparison of the languages, see pages 90–126. ISBN 978-3-11-046175-6. ^ a b c Anna Giacalone Ramat; Paolo Ramat (2015). The Indo-European Languages. Routledge. pp. 26–31. ISBN 978-1-134-92187-4. ^ "Ancient Tablet Found: Oldest Readable Writing in Europe". 1 April 2011. ^ Jenny Rose (18 August 2011). Zoroastrianism: A Guide for the Perplexed. Bloomsbury Publishing. pp. 75–76. ISBN 978-1-4411-2236-0. ^ Ahmad Hasan Dani; Vadim Mikhaĭlovich Masson (1999). History of Civilizations of Central Asia. Motilal Banarsidass. pp. 357–358. ISBN 978-81-208-1407-3. ^ Colin P. Masica 1993, p. 34. ^ Levin, Saul. Semitic and Indo-European, Volume 2. John Benjamins Publishing Company. p. 431. ^ Edwin Francis Bryant; Laurie L. Patton. The Indo-Aryan Controversy: Evidence and Inference in Indian History. Psychology Press. p. 208. ^ R.H. Robins (2014). General Linguistics. Routledge. pp. 346–347. ISBN 978-1-317-88763-8. ^ a b J. P. Mallory & D. Q. Adams 2006, p. 6. ^ Thomas Burrow 2001, p. 6. ^ Colin P. Masica 1993, p. 36-38. ^ Thomas Burrow 2001, pp. 30-32. ^ Thomas Burrow 2001, pp. 30-34. ^ a b Michael Meier-Brügger (2003). Indo-European Linguistics. Walter de Gruyter. p. 20. ISBN 978-3-11-017433-5. ^ A. Berriedale Keith (1993). A history of Sanskrit literature. Motilal Banarsidass. p. 4. ISBN 978-81-208-1100-3. ^ Barbara A. Holdrege 2012, pp. 229–230. ^ Bryant 2001, pp. 66-67. ^ Louis Renou & Jagbans Kishore Balbir 2004, pp. 5-6. ^ Witzel, M (1997). Inside the texts, beyond the texts: New approaches to the study of the Vedas (PDF). Cambridge, Massachusetts: Harvard University Press. p. 9. Retrieved 17 July 2018. ^ Witzel, M (1997). Inside the texts, beyond the texts: New approaches to the study of the Vedas (PDF). Cambridge, Massachusetts: Harvard University Press. pp. 16–17. Retrieved 17 July 2018. ^ a b Signe Cohen (2017). The Upanisads: A Complete Guide. Taylor & Francis. pp. 11–17. ISBN 978-1-317-63696-0. ^ Edwin Bryant (2001). The Quest for the Origins of Vedic Culture: The Indo-Aryan Migration Debate. Oxford University Press. p. 249. ISBN 978-0-19-803151-2. ^ Andrew Robinson (2014). India: A Short History. Thames & Hudson. pp. 56–57. ISBN 978-0-500-77195-2. ^ Roger D. Woodard (2008). The Ancient Languages of Asia and the Americas. Cambridge University Press. p. 1. ISBN 978-0-521-68494-1. ^ John Jeffrey Lowe (2015). Participles in Rigvedic Sanskrit: The Syntax and Semantics of Adjectival Verb Forms. Oxford University Press. pp. 2–3. ISBN 978-0-19-870136-1. ^ Stephanie W. Jamison & Joel P. Brereton 2014, pp. 10-11, 72. ^ Stephanie W. Jamison & Joel P. Brereton 2014, p. 50. ^ Stephanie W. Jamison & Joel P. Brereton 2014, pp. 66-67. ^ Richard Gombrich (2006). Theravada Buddhism: A Social History from Ancient Benares to Modern Colombo. Routledge. pp. 24–25. ISBN 978-1-134-90352-8. ^ Gérard Huet; Amba Kulkarni; Peter Scharf (2009). Sanskrit Computational Linguistics: First and Second International Symposia Rocquencourt, France, October 29-31, 2007 Providence, RI, USA, May 15-17, 2008, Revised Selected Papers. Springer. pp. v–vi. ISBN 978-3-642-00154-3. ^ The Editors of Encyclopaedia Britannica (2013). Ashtadhyayi, Work by Panini. Encyclopædia Britannica. Retrieved 23 October 2017. , Quote: "Ashtadhyayi, Sanskrit Aṣṭādhyāyī ("Eight Chapters"), Sanskrit treatise on grammar written in the 6th to 5th century BCE by the Indian grammarian Panini." ^ a b Harold G. Coward 1990, pp. 13-14, 111. ^ Pāṇini; Sumitra Mangesh Katre (1989). Aṣṭādhyāyī of Pāṇini. Motilal Banarsidass. pp. xix–xxi. ISBN 978-81-208-0521-7. ^ Louis Renou & Jean Filliozat. L'Inde Classique, manuel des etudes indiennes, vol.II pp.86–90, École française d'Extrême-Orient, 1953, reprinted 2000. ISBN 2-85539-903-3. ^ Rens Bod (2013). A New History of the Humanities: The Search for Principles and Patterns from Antiquity to the Present. Oxford University Press. pp. 14–18. ISBN 978-0-19-164294-4. ^ Yuji Kawaguchi; Makoto Minegishi; Wolfgang Viereck (2011). Corpus-based Analysis and Diachronic Linguistics. John Benjamins Publishing Company. pp. 223–224. ISBN 978-90-272-7215-7. ^ John Bowman (2005). Columbia Chronologies of Asian History and Culture. Columbia University Press. p. 728. ISBN 978-0-231-50004-3. ^ Richard Salomon (1998). Indian Epigraphy: A Guide to the Study of Inscriptions in Sanskrit, Prakrit, and the other Indo-Aryan Languages. Oxford University Press. p. 11. ISBN 978-0-19-535666-3. ^ a b Juhyung Rhi (2009). "On the Peripheries of Civilizations: The Evolution of a Visual Tradition in Gandhāra". Journal of Central Eurasian Studies. 1: 5, 1–13. ^ Rita Sherma; Arvind Sharma (2008). Hermeneutics and Hindu Thought: Toward a Fusion of Horizons. Springer. p. 235. ISBN 978-1-4020-8192-7. ^ Falk, Harry (1993). Schrift im alten Indien: ein Forschungsbericht mit Anmerkungen (in German). Gunter Narr Verlag. pp. 109–167. ^ Salomon, Richard (1995). "Review: On the Origin of the Early Indian Scripts". Journal of the American Oriental Society. 115 (2): 271–278. doi:10.2307/604670. JSTOR 604670. ^ Oskar von Hinüber (1989). 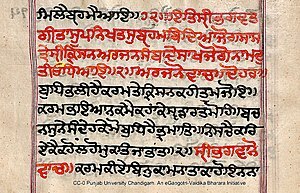 Der Beginn der Schrift und frühe Schriftlichkeit in Indien. Akademie der Wissenschaften und der Literatur. pp. 241–245. OCLC 22195130. ^ Jack Goody (1987). The Interface Between the Written and the Oral. Cambridge University Press. pp. 110–124. ISBN 978-0-521-33794-6. ^ Louis Renou & Jagbans Kishore Balbir 2004, pp. 53. ^ Louis Renou & Jagbans Kishore Balbir 2004, pp. 53-54. ^ Thomas Burrow 2001, pp. 33-34. ^ a b c d e A. M. Ruppel 2017, pp. 378-383. ^ Arthur Anthony Macdonell (1997). A Sanskrit Grammar for Students. Motilal Banarsidass. pp. 236–244. ISBN 978-81-208-0505-7. ^ Louis Renou & Jagbans Kishore Balbir 2004, pp. 1-59. ^ Anne Kessler-Persaud 2009, p. 3. ^ John L. Brockington 1998, p. 379. ^ Alfred C. Woolner (1986). Introduction to Prakrit. Motilal Banarsidass. pp. 6, context: 1–10. ISBN 978-81-208-0189-9. ^ Clarence Maloney (1978). Language and Civilization Change in South Asia. Brill Academic. pp. 111–114. ISBN 978-90-04-05741-8. ^ Gaurinath Bhattacharyya Shastri (1987). A Concise History of Classical Sanskrit Literature. Motilal Banarsidass. pp. 18–19. ISBN 978-81-208-0027-4. ^ Rune Edvin Anders Johansson (1981). Pali Buddhist Texts: Explained to the Beginner. Psychology Press. p. 7. ISBN 978-0-7007-1068-3. , Quote: "Pali is known mainly as the language of Theravada Buddhism. (...) Very little is known about its origin. We do not know where it was spoken or if it originally was a spoken language at all. The ancient Ceylonese tradition says that the Buddha himself spoke Magadhi and that this language was identical to Pali." ^ a b c Paul Dundas (2003). The Jains. Routledge. pp. 69–70. ISBN 978-0-415-26606-2. ^ "Ethnologue report for language code: pli". Ethnologue. Retrieved 20 July 2018. ^ P.S. Krishnavarma (1881). Sanskrit as a living language in India: Journal of the National Indian Association. Henry S. King & Company. pp. 737–745. ^ a b c Gaurinath Bhattacharyya Shastri (1987). A Concise History of Classical Sanskrit Literature. Motilal Banarsidass. pp. 20–23. ISBN 978-81-208-0027-4. ^ Moriz Winternitz (1996). A History of Indian Literature. Motilal Banarsidass. pp. 42–46. ISBN 978-81-208-0264-3. ^ a b c d Deshpande 2011, pp. 222-223. ^ a b Sheldon Pollock (1996). Jan Houben (ed.). The Sanskrit Cosmopolis, A.D. 300–1300: Transculturation, Vernacularization, and the Question of Ideology, in "Ideology and status of Sanskrit: contributions to the history of the Sanskrit language". Leiden New York: E.J. Brill. pp. 197–199, for context and details, please see 197–239. ISBN 978-90-04-10613-0. ^ Gérard Huet; Amba Kulkarni; Peter Scharf (2009). Sanskrit Computational Linguistics. Springer. pp. v–vi. ISBN 978-3-642-00155-0. ^ P M Scharf; M Hyman (2009). V Govindaraju and S Setlur (ed.). Guide to OCR for Indic Scripts: Document Recognition and Retrieval. Springer. p. 238. ISBN 978-1-84800-330-9. ^ a b Justin McDaniel; Lynn Ransom (2015). From Mulberry Leaves to Silk Scrolls: New Approaches to the Study of Asian Manuscript Traditions. University of Pennsylvania Press. pp. 233–234. ISBN 978-0-8122-4736-7. ^ Gaurinath Bhattacharyya Shastri (1987). A Concise History of Classical Sanskrit Literature. Motilal Banarsidass. ISBN 978-81-208-0027-4. ^ Banerji 1989, pp. 618-632, see also the extended list of Sanskrit texts in Part II. ^ a b c d J.F. Staal (1976). Herman Parret (ed.). History of Linguistic Thought and Contemporary Linguistics. Walter de Gruyter. pp. 102–130. ISBN 978-3-11-005818-5. ^ Thomas Burrow 2001, pp. 57-64, 289, 319. ^ J.F. Staal (1976). Herman Parret (ed.). History of Linguistic Thought and Contemporary Linguistics. Walter de Gruyter. pp. 121–125. ISBN 978-3-11-005818-5. ^ Wayman 1965, pp. 111-115. ^ John Kelly (1996). Jan E. M. Houben (ed.). Ideology and Status of Sanskrit: Contributions to the History of the Sanskrit Language. BRILL Academic. pp. 87–102. ISBN 978-90-04-10613-0. ^ Louis Renou et al. ^ Umāsvāti 1994, p. xi–xiii, Quote: "That Which Is, known as the Tattvartha Sutra to Jains, is recognized by all four Jain traditions as the earliest, most authoritative and comprehensive summary of their religion.". ^ Paul Dundas (2006). Patrick Olivelle (ed.). Between the Empires : Society in India 300 BCE to 400 CE. Oxford University Press. pp. 395–396. ISBN 978-0-19-977507-1. ^ Colin P. Masica 1993, pp. 55-56. ^ Keat Gin Ooi (2004). Southeast Asia: A Historical Encyclopedia, from Angkor Wat to East Timor. ABC-CLIO. p. 643. ISBN 978-1-57607-770-2. ^ Robert E. Buswell Jr. & Donald S. Lopez Jr. 2013, p. 504. ^ Stephen K. Stein (2017). The Sea in World History: Exploration, Travel, and Trade [2 volumes]. ABC-CLIO. p. 147. ISBN 978-1-4408-3551-3. ^ Charles Taliaferro (2010). A Dictionary of Philosophy of Religion. Bloomsbury Publishing. pp. 245–246. ISBN 978-1-4411-8504-4. ^ a b Michael C. Howard 2012, p. 21. ^ Dalai Lama 1979, pp. 3-5. ^ a b c Thomas Burrow 2001, p. 60. ^ Houben, Jan (1996). Ideology and status of Sanskrit: contributions to the history of the Sanskrit language. Leiden New York: E.J. Brill. p. 11. ISBN 978-90-04-10613-0. ^ Hock, Hans Henrich (1983). Kachru, Braj B (ed.). "Language-death phenomena in Sanskrit: grammatical evidence for attrition in contemporary spoken Sanskrit". Studies in the Linguistic Sciences. 13:2. ^ Sheldon Pollock 2009, pp. 167-168. ^ a b c d Hanneder, J. (2002). "On "The Death of Sanskrit"". Indo-Iranian Journal. 45 (4): 293–310. doi:10.1023/a:1021366131934. ^ a b c d e Pollock, Sheldon (2001). "The Death of Sanskrit". Comparative Studies in Society and History. 43 (2): 392–426. doi:10.1017/s001041750100353x. ^ Audrey Truschke (2016). Culture of Encounters: Sanskrit at the Mughal Court. Columbia University Press. pp. 9–15, 30–36, 45–47. ISBN 978-0-231-54097-1. ^ a b Madhav M. Deshpande (1993). Sanskrit & Prakrit, Sociolinguistic Issues. Motilal Banarsidass. pp. 118–124. ISBN 978-81-208-1136-2. ^ B. B. Kachru (1981). Kashmiri Literature. Otto Harrassowitz Verlag. pp. 24–25. ISBN 978-3-447-02129-6. ^ Gurnam Singh Sidhu Brard (2007). East of Indus. Hemkunt Press. pp. 80–82. ISBN 978-81-7010-360-8. ^ John Snelling (1991). The Buddhist Handbook. Inner Traditions. pp. vi, 1. ISBN 978-0-89281-319-3. ^ M. Ramakrishnan Nair (1974). Sanskrit Family: A Comparative Study of Indian & European Languages as a Whole. Ramakrishnan Nair. p. 5. ^ Hatcher, B. A. (2007). "Sanskrit and the morning after: The metaphorics and theory of intellectual change". Indian Economic. 44 (3): 333–361. doi:10.1177/001946460704400303. ^ Moriz Winternitz (1996). A History of Indian Literature, Volume 1. Motilal Banarsidass. pp. 37–39. ISBN 978-81-208-0264-3. ^ Hatcher, Brian A. (2016). "Sanskrit and the morning after". The Indian Economic & Social History Review. 44 (3): 333–361. doi:10.1177/001946460704400303. ISSN 0019-4646. ^ Robert P. Goldman & Sally J Sutherland Goldman 2002, pp. xi-xii. ^ Seth, Sanjay (2007). Subject lessons: the Western education of colonial India. Durham, NC: Duke University Press. pp. 172–176. ISBN 978-0-8223-4105-5. ^ a b c d e Colin P. Masica 1993, pp. 50-57. ^ Philipp Strazny (2013). Encyclopedia of Linguistics. Routledge. pp. 499–500. ISBN 978-1-135-45522-4. ^ Sagarika Dutt (2014). India in a Globalized World. Oxford University Press. pp. 16–17. ISBN 978-0-7190-6901-7. ^ Cynthia Groff (2017). The Ecology of Language in Multilingual India. Palgrave Macmillan. pp. 183–185. ISBN 978-1-137-51961-0. ^ Burjor Avari (2016). India: The Ancient Past: A History of the Indian Subcontinent from c. 7000 BCE to CE 1200. Routledge. pp. 66–67. ISBN 978-1-317-23673-3. ^ Sheldon Pollock (1996). Jan E. M. Houben (ed.). Ideology and Status of Sanskrit. BRILL Academic. pp. 197–223 with footnotes. ISBN 978-90-04-10613-0. ^ William S.-Y. Wang; Chaofen Sun (2015). The Oxford Handbook of Chinese Linguistics. Oxford University Press. pp. 6–19, 203–212, 236–245. ISBN 978-0-19-985633-6. ^ Thomas Burrow 2001, pp. 63-66. ^ Jinah Kim (2013). Receptacle of the Sacred: Illustrated Manuscripts and the Buddhist Book Cult in South Asia. University of California Press. pp. 8, 13–15, 49. ISBN 978-0-520-27386-3. ^ a b Pieter C. Verhagen (1994). A History of Sanskrit Grammatical Literature in Tibet. BRILL. pp. 159–160. ISBN 978-90-04-09839-8. ^ Salomon 1998, pp. 154-155. ^ Salomon 1998, pp. 158-159. ^ Salomon 1998, pp. 155-157. ^ a b Salomon 1998, p. 158. ^ Salomon 1998, p. 157. ^ Salomon 1998, p. 155. ^ William M. Johnston (2013). Encyclopedia of Monasticism. Routledge. p. 926. ISBN 978-1-136-78716-4. ^ a b Todd T. Lewis; Subarna Man Tuladhar (2009). Sugata Saurabha An Epic Poem from Nepal on the Life of the Buddha by Chittadhar Hridaya. Oxford University Press. pp. 343–344. ISBN 978-0-19-988775-0. ^ Salomon 1998, pp. 159-160. ^ Patrick Olivelle (2006). Between the Empires: Society in India 300 BCE to 400 CE. Oxford University Press. p. 356. ISBN 978-0-19-977507-1. ^ Salomon 1998, pp. 152-153. ^ Rewi Alley (1957). Journey to Outer Mongolia: a diary with poems. Caxton Press. pp. 27–28. ^ a b Salomon 1998, pp. 153-154. ^ Gian Luca Bonora; Niccolò Pianciola; Paolo Sartori (2009). Kazakhstan: Religions and Society in the History of Central Eurasia. U. Allemandi. pp. 65, 140. ISBN 978-88-42217-558. ^ Bjarke Frellesvig (2010). A History of the Japanese Language. Cambridge University Press. pp. 164–165, 183. ISBN 978-1-139-48880-8. ^ Donald S. Lopez Jr. (2017). Hyecho's Journey: The World of Buddhism. University of Chicago Press. pp. 16–22, 33–42. ISBN 978-0-226-51806-0. ^ Salomon 1998, p. 160 with footnote 134. ^ "Comparative speaker's strength of scheduled languages − 1971, 1981, 1991 and 2001". Census of India, 2001. Office of the Registrar and Census Commissioner, India. Archived from the original on 11 April 2009. Retrieved 31 December 2009. ^ a b Cynthia Groff (2013). Jo Arthur Shoba and Feliciano Chimbutane (ed.). Bilingual Education and Language Policy in the Global South. Routledge. p. 178. ISBN 978-1-135-06885-1. ^ "This village speaks gods language – India – The Times of India". The Times of India. 13 August 2005. Retrieved 5 April 2012. ^ Ghosh, Aditya (20 September 2008). "Sanskrit boulevard". Hindustan Times. Retrieved 5 April 2012. ^ Bhaskar, B.V.S. (31 July 2009). "Mark of Sanskrit". The Hindu. ^ "Orissa's Sasana village – home to Sanskrit pundits! !". The India Post. 9 April 2010. Retrieved 5 April 2012. ^ National Population and Housing Census 2011 (PDF) (Report). 1. Kathmandu: Central Bureau of Statistics, Government of Nepal. November 2012. Archived from the original (PDF) on 28 December 2013. ^ "Sanskrit second official language of Uttarakhand". The Hindu. 21 January 2010. ISSN 0971-751X. Retrieved 2 October 2018. ^ a b c d e Jamison 2008, pp. 8-9. ^ a b c Jamison 2008, p. 9. ^ Robert P. Goldman & Sally J Sutherland Goldman 2002, pp. 1-9. ^ Michael Coulson, Richard Gombrich & James Benson 2011, pp. 21-36. ^ Colin P. Masica 1993, pp. 163-165. ^ a b Robert P. Goldman & Sally J Sutherland Goldman 2002, pp. 13-19. ^ Colin P. Masica 1993, p. 146 notes of this diacritic that "there is some controversy as to whether it represents a homorganic nasal stop [...], a nasalised vowel, a nasalised semivowel, or all these according to context". ^ This visarga is a consonant, not a vowel. It's a post-vocalic voiceless glottal fricative [h], and an allophone of s (or less commonly r) usually in word-final position. Some traditions of recitation append an echo of the preceding vowel after the [h] (Wikner 1996, p. 6): इः [ihi]. Colin P. Masica 1993, p. 146 considers the visarga, along with letters ङ ṅa and ञ ña, for the "largely predictable" velar and palatal nasals, to be examples of "phonetic overkill in the [writing] system". ^ a b Colin P. Masica 1993, pp. 160-161. ^ a b c d e Jamison 2008, pp. 9-10. ^ Michael Coulson, Richard Gombrich & James Benson 2011, pp. 1-20. ^ a b c Jamison 2008, p. 10. ^ A. M. Ruppel 2017, pp. 18-19. ^ a b c Jamison 2008, pp. 10-11. ^ Jamison 2008, p. 11. ^ a b Jamison 2008, pp. 11-12. ^ a b c Jamison 2008, p. 12. ^ Colin P. Masica 1993, pp. 164-166. ^ a b c d Jamison 2008, p. 13. ^ Colin P. Masica 1993, pp. 163-164. ^ Jamison 2008, pp. 13-14. ^ a b c d e f Jamison 2008, p. 15. ^ a b c d e Jamison 2008, pp. 15-16. ^ a b c d Jamison 2008, p. 20. ^ a b c A. M. Ruppel (2017). The Cambridge Introduction to Sanskrit. Cambridge University Press. pp. 31–33. ISBN 978-1-107-08828-3. ^ a b c d e A. M. Ruppel (2017). The Cambridge Introduction to Sanskrit. Cambridge University Press. pp. 33–34. ISBN 978-1-107-08828-3. ^ a b c d e Jamison 2008, pp. 19-20. ^ a b c d e f g h Jamison 2008, pp. 16-17. ^ Jamison 2008, pp. 17-18. ^ a b Paul Kiparsky (2014). E.F.K. Koerner and R.E. Asher (ed.). Concise History of the Language Sciences: From the Sumerians to the Cognitivists. Elsevier. pp. 59–65. ISBN 978-1-4832-9754-5. ^ a b Jamison 2008, p. 21. ^ a b Jamison 2008, pp. 20-21. ^ Robert P. Goldman & Sally J Sutherland Goldman 2002, pp. 59, 79, 91, 113. ^ Thomas Burrow 2001, pp. 191-194. ^ Moriz Winternitz (1988). A History of Indian Literature: Buddhist literature and Jaina literature. Motilal Banarsidass. p. 577. ISBN 978-81-208-0265-0. ^ a b Annette Wilke & Oliver Moebus 2011, pp. 391-392 with footnotes. ^ Thomas Egenes (1996). Introduction to Sanskrit. Motilal Banarsidass. pp. 86–91. ISBN 978-81-208-1693-0. ^ Winthrop Sargeant (2010). Christopher Key Chapple (ed.). The Bhagavad Gita: Twenty-fifth–Anniversary Edition. State University of New York Press. pp. 3–8. ISBN 978-1-4384-2840-6. ^ J. L. Brockington (1998). The Sanskrit Epics. BRILL Academic. pp. 117–130. ISBN 978-90-04-10260-6. ^ Peter Scharf (2013). Keith Allan (ed.). The Oxford Handbook of the History of Linguistics. Oxford University Press. pp. 228–234. ISBN 978-0-19-164344-6. ^ a b Alex Preminger; Frank J. Warnke; O. B. Hardison Jr. (2015). Princeton Encyclopedia of Poetry and Poetics. Princeton University Press. pp. 394–395. ISBN 978-1-4008-7293-0. ^ Har Dutt Sharma (1951). "Suvrttatilaka". Poona Orientalist: A Quarterly Journal Devoted to Oriental Studies. XVII: 84. ^ Patrick Olivelle (1998). The Early Upanisads : Annotated Text and Translation. Oxford University Press. pp. xvi–xviii, xxxvii. ISBN 978-0-19-535242-9. ^ Patrick Olivelle (2008). Collected Essays: Language, Texts and Society. Firenze University Press. pp. 293–295. ISBN 978-88-8453-729-4. ^ Maurice Winternitz 1963, pp. 3-4 with footnotes. ^ Patrick Olivelle (2008). Collected Essays: Language, Texts and Society. Firenze University Press. pp. 264–265. ISBN 978-88-8453-729-4. ^ a b c d Tatyana J. Elizarenkova (1995). Language and Style of the Vedic Rsis. State University of New York Press. pp. 111–121. ISBN 978-0-7914-1668-6. ^ Salomon 1998, p. 10. ^ Salomon 1998, pp. 7-10, 86. ^ a b Salomon 1998, p. 11. Takao Hayashi (2008). Gavin Flood (ed.). The Blackwell Companion to Hinduism. John Wiley & Sons. p. 365. ISBN 978-0-470-99868-7. ^ Lopon Nado (1982), The Development of Language in Bhutan, The Journal of the International Association of Buddhist Studies, Volume 5, Number 2, page 95, Quote: "Under different teachers, such as the Brahmin Lipikara and Deva Vidyasinha, he mastered Indian philology and scripts. According to Lalitavistara, there were as many as sixty-four scripts in India." ^ Salomon 1998, pp. 8-9 with footnotes. ^ Salomon 1998, pp. 8-9. ^ a b c Salomon 1998, pp. 8-14. ^ Salomon 1998, pp. 11-12. ^ a b Peter T. Daniels 1996, pp. 371-372. ^ Peter T. Daniels 1996, pp. 373-374, 376-378. ^ a b c d e f g Salomon 1998, pp. 14-16. ^ Peter T. Daniels 1996, pp. 373-375. ^ Peter T. Daniels 1996, pp. 373-376. ^ a b Peter T. Daniels 1996, pp. 373-374. ^ a b c d A. M. Ruppel 2017, pp. 9-10. ^ Margaret Magnus (1999). Gods of the Word: Archetypes in the Consonants. Thomas Jefferson University Press. p. 31. ISBN 978-0-943549-52-1. ^ Hartmut Scharfe (1977). Grammatical Literature. Otto Harrassowitz Verlag. pp. 118 with footnote 15. ISBN 978-3-447-01706-0. ^ Charles Higham (2014). Encyclopedia of Ancient Asian Civilizations. Infobase Publishing. p. 294. ISBN 978-1-4381-0996-1. ^ Peter T. Daniels 1996, pp. 376-380. ^ Dhanesh Jain & George Cardona 2007, pp. 69-70 in Chapter 3 by Salomon. ^ Dhanesh Jain & George Cardona 2007, pp. 68-72 in Chapter 3 by Salomon, Quote: "Sanskrit and the Prakrits, at different times and places were written in a vast number of forms and derivatives of Brahmi. In the premodern period, in other words, these languages would be written by a given scribe in whatever happened to be the current local script (...)" – Richard Salomon, page 70. ^ Dhanesh Jain & George Cardona 2007, p. 72 in Chapter 3 by Salomon. ^ Bahadur Chand Chhabra (1970). "Sugh Terracotta with Brahmi Barakhadi". Bull. National Mus. (2): 14–16. ^ a b Dhanesh Jain & George Cardona 2007, pp. 68-70 in Chapter 3 by Salomon. ^ Sures Chandra Banerji (1989). A Companion to Sanskrit Literature. Motilal Banarsidass. pp. 671–672. ISBN 978-81-208-0063-2. ^ Dhanesh Jain & George Cardona 2007, pp. 70, 75-77 in Chapter 3 by Salomon. ^ a b c Dhanesh Jain & George Cardona 2007, pp. 75-77 in Chapter 3 by Salomon. ^ John Norman Miksic; Goh Geok Yian (2016). Ancient Southeast Asia. Taylor & Francis. p. 178. ISBN 978-1-317-27904-4. ^ Dhanesh Jain & George Cardona 2007, pp. 70-78 in Chapter 3 by Salomon. ^ Dhanesh Jain & George Cardona 2007, pp. 70-71, 75-76 in Chapter 3 by Salomon. ^ Dhanesh Jain & George Cardona 2007, pp. 70-71 in Chapter 3 by Salomon. ^ Dhanesh Jain & George Cardona 2007, pp. 72-73 in Chapter 3 by Salomon. ^ "Modern Transcription of Sanskrit". autodidactus.org. ^ Jan Gonda (2016). Visnuism and Sivaism: A Comparison. Bloomsbury Academic. pp. 166 note 243. ISBN 978-1-4742-8082-2. ^ James Hegarty (2013). Religion, Narrative and Public Imagination in South Asia: Past and Place in the Sanskrit Mahabharata. Routledge. pp. 46 note 118. ISBN 978-1-136-64589-1. ^ Theo Damsteegt (1978). Epigraphical Hybrid Sanskrit. Brill Academic. pp. 209–211. ^ Sonya Rhie Quintanilla (2007). History of Early Stone Sculpture at Mathura: Ca. 150 BCE - 100 CE. BRILL Academic. pp. 254–255. ISBN 978-90-04-15537-4. ^ Salomon 1998, p. 87 with footnotes. ^ Salomon 1998, p. 93. ^ a b c d Salomon 1998, pp. 87-88. ^ Sonya Rhie Quintanilla (2007). History of Early Stone Sculpture at Mathura: Ca. 150 BCE - 100 CE. BRILL Academic. pp. 260–263. ISBN 978-90-04-15537-4. ^ Sonya Rhie Quintanilla (2007). History of Early Stone Sculpture at Mathura: Ca. 150 BCE - 100 CE. BRILL Academic. p. 260. ISBN 978-90-04-15537-4. ^ Salomon 1998, p. 88. ^ Inscription No21 in Janert, l (1961). Mathura Inscriptions. ^ Salomon 1998, pp. 88-89. ^ a b Salomon 1998, pp. 89-90. ^ a b c Salomon 1998, p. 89. ^ a b Salomon 1998, pp. 91-94. ^ Salomon 1998, pp. 90-91. ^ Salomon 1998, pp. 90-91 with footnote 51. ^ Salomon 1998, pp. 91-93. ^ Salomon 1998, p. 92, Quote: "Finally, after this transitional period in the fourth and early fifth centuries AD, Prakrit fell out of use completely in southern Indian inscriptions. For the next few centuries Sanskrit was the sole epigraphic language, until the regional Dravidian languages began to come into use around the seventh century"..
^ a b Salomon 1998, p. 92. ^ a b Salomon 1998, pp. 92-93. ^ Salomon 1998, pp. 110-112, 132-148. ^ Salomon 1998, pp. 110-126. ^ Salomon 1998, pp. 126-132. ^ Salomon 1998, pp. 148-149. ^ a b Salomon 1998, pp. 149-150. ^ a b Peter T. Daniels 1996, pp. 445-447 in the chapter by Christopher Court. ^ Peter T. Daniels 1996, pp. 445-456 in the chapter by Christopher Court. ^ Peter T. Daniels 1996, pp. 446-448 in the chapter by Christopher Court. ^ Colin P. Masica 1993, pp. 137-144. ^ Banerji 1989, p. 672 with footnotes. ^ Dhanesh Jain & George Cardona 2007. ^ John L. Brockington 1998. ^ Sures Chandra Banerji (1989). A Companion to Sanskrit Literature: Spanning a Period of Over Three Thousand Years, Containing Brief Accounts of Authors, Works, Characters, Technical Terms, Geographical Names, Myths, Legends and Several Appendices. Motilal Banarsidass. pp. 1–4, with a long list in Part II. ISBN 978-81-208-0063-2. ^ a b Banerji 1989, p. 634-635 with the list in Appendix IX. ^ Paul Dundas (2003). The Jains. Routledge. pp. 68–76, 149, 307–310. ISBN 978-1-134-50165-6. ^ Wendy Doniger (1993). Purana Perennis: Reciprocity and Transformation in Hindu and Jaina Texts. State University of New York Press. pp. 192–193. ISBN 978-0-7914-1381-4. ^ Oberlies, Thomas (2003). A Grammar of Epic Sanskrit. Berlin New York: Walter de Gruyter. pp. xxvii–xxix. ISBN 978-3-11-014448-2. ^ Edgerton, Franklin (2004). Buddhist Hybrid Sanskrit grammar and dictionary. Delhi: Motilal Banarsidass. ISBN 978-81-215-1110-0. ^ Staal 1963, pp. 261. ^ Rao, Velcheru (2002). Classical Telugu poetry an anthology. Berkeley, Calif: University of California Press. p. 3. ISBN 978-0-520-22598-5. ^ Carey, William (1805). A Grammar of the Marathi Language. Serampur [sic]: Serampore Mission Press. ISBN 9781108056311. ^ a b c d William S.-Y. Wang; Chaofen Sun (2015). The Oxford Handbook of Chinese Linguistics. Oxford University Press. pp. 5–6, 12, 236–247. ISBN 978-0-19-985633-6. , Quote: "In chapter 18, Shi Xiangdong makes it clear that the influence of Buddhist Sanskrit on the Chinese language has been considerable. Many words have crossed the line from religious discourse to everyday use." ^ Charles Orzech; Henrik Sørensen; Richard Payne (2011). Esoteric Buddhism and the Tantras in East Asia. BRILL Academic. pp. 985–996. ISBN 978-90-04-18491-6. ^ William S.-Y. Wang; Chaofen Sun (2015). The Oxford Handbook of Chinese Linguistics. Oxford University Press. pp. 5–6. ISBN 978-0-19-985633-6. ^ Gulik, R. H. (2001). Siddham: an essay on the history of Sanskrit studies in China and Japan. New Delhi: International Academy of Indian Culture and Aditya Prakashan. pp. 5–133. ISBN 978-81-7742-038-8. ^ Zoetmulder, P. J. (1982). Old Javanese-English Dictionary. ^ Joshi, Manoj. Passport India 3rd Ed., eBook. World Trade Press. p. 15. ^ Orzech, Charles; Sørensen, Henrik; Payne, Richard (2011). Esoteric Buddhism and the Tantras in East Asia. BRILL. p. 985. ISBN 978-9004184916. ^ Paul Dundas (1996). Jan E. M. Houben (ed.). Ideology and Status of Sanskrit: Contributions to the History of the Sanskrit Language. BRILL. pp. 152–155. ISBN 978-90-04-10613-0. ^ Swami Veda Bharati (1968). Ritual songs and folksongs of the Hindus of Surinam: proefschrift. Brill Archive. pp. 11–22. GGKEY:GJ0YGRH08YW. ^ John Stratton Hawley (1996). Devi: Goddesses of India. University of California Press. pp. 42–44. ISBN 978-0-520-20058-6. ^ John Stratton Hawley (1996). Devi: Goddesses of India. University of California Press. pp. 187–188. ISBN 978-0-520-20058-6. ^ Christopher John Fuller (2003). The Renewal of the Priesthood: Modernity and Traditionalism in a South Indian Temple. Princeton University Press. pp. 49–53. ISBN 978-0-691-11658-7. ^ Richard H. Davis (2014). The Bhagavad Gita: A Biography. Princeton University Press. p. 179. ISBN 978-1-4008-5197-3. ^ Prajapati, Manibhai (2005). Post-independence Sanskrit literature: a critical survey (1 ed.). New Delhi: Standard publishers India. ^ "Sanskrit's first Jnanpith winner is a 'poet by instinct'". The Indian Express. 14 January 2009. ^ "Samveda". Retrieved 5 May 2015. ^ "Awards for World Music 2008". BBC. ^ Haspelmath, Martin (2009). Loanwords in the World's Languages: A Comparative Handbook. De Gruyter Mouton. p. 724. ISBN 978-3110218435. ^ Jose G. Kuizon (1964). "The Sanskrit Loan-words in the Cebuano-Bisayan Language". Asian Folklore Studies. 23 (1): 111–158. doi:10.2307/1177640. JSTOR 1177640. ^ Sak-Humphry, Channy. The Syntax of Nouns and Noun Phrases in Dated Pre-Angkorian Inscriptions. Mon Khmer Studies 22: 1–26. ^ a b Mayank Austen Soofi (23 November 2012). "Delhi's Belly | Sanskrit-vanskrit". Livemint. Retrieved 6 December 2012. ^ "News on Air". News On Air. 15 August 2012. Archived from the original on 5 September 2012. Retrieved 6 December 2012. ^ "News archive search". Newsonair. 15 August 2012. Archived from the original on 15 January 2013. Retrieved 6 December 2012. ^ "Doordarshan News Live webcast". Webcast.gov.in. Retrieved 6 December 2012. ^ Los Angeles County Museum of Art; Pratapaditya Pal (1985). Art of Nepal: A Catalogue of the Los Angeles County Museum of Art Collection. University of California Press. pp. 233–234. ISBN 978-0-520-05407-3. ^ "In 2013, UPA to CBSE: Make Sanskrit a must". The Indian Express. 4 December 2014. ^ "Sanskrit @ St James". Sanskrit @ St James. Retrieved 8 October 2017. ^ Varija Yelagalawadi. "Why SAFL?". Samskrita Bharati USA. Archived from the original on 12 May 2015. ^ Sydney Grammar School. "Headmaster's Introduction". Archived from the original on 15 March 2015. ^ Friedrich Max Müller (1859). A History of Ancient Sanskrit Literature So Far as it Illustrates the Primitive Religion of the Brahmans. Williams and Norgate. p. 1. ^ Thomas R. Trautmann (2004). Aryans and British India. Yoda Press. pp. 73–84, 62–87. ISBN 978-81-902272-1-6. ^ Thomas R. Trautmann (2004). Aryans and British India. Yoda Press. pp. 96–97. ISBN 978-81-902272-1-6. ^ Thomas R. Trautmann (2004). Aryans and British India. Yoda Press. pp. 124–126. ISBN 978-81-902272-1-6. ^ Thomas R. Trautmann (2004). Aryans and British India. Yoda Press. pp. 133–142. ISBN 978-81-902272-1-6. ^ Upadhyay, Pankaj; Jaiswal, Umesh Chandra; Ashish, Kumar (2014). "TranSish: Translator from Sanskrit to English-A Rule based Machine Translation". International Journal of Current Engineering and Technology: 2277–4106. ^ Vibhuti Patel (18 December 2011). "Gandhi as operatic hero". The Hindu. ^ Rahim, Sameer (4 December 2013). "The opera novice: Satyagraha by Philip Glass". Telegraph. london. ^ Morgan, Les (2011). Croaking frogs: a guide to Sanskrit metrics and figures of speech. Los Angeles: Mahodara Press. p. 1. ISBN 978-1-4637-2562-4. ^ Doval, Nikita (24 June 2013). "Classic conversations". The Week. Archived from the original on 31 October 2014. ^ "Yoga and Music". Yoga Journal. ^ "Indiana Jones and the Temple of Doom (John Williams)". Filmtracks. 11 November 2008. Retrieved 5 April 2012. ^ "Episode I FAQ". Star Wars Faq. Archived from the original on 11 October 2003. ^ "Battlestar Galactica (TV Series 2004–2009)". IMDb. ^ "The Child In Us Lyrics – Enigma". Lyricsfreak.com. Retrieved 27 January 2013. H. W. Bailey (1955). "Buddhist Sanskrit". The Journal of the Royal Asiatic Society of Great Britain and Ireland. Cambridge University Press. 87 (1/2): 13–24. doi:10.1017/S0035869X00106975. JSTOR 25581326. Banerji, Sures (1989). A companion to Sanskrit literature: spanning a period of over three thousand years, containing brief accounts of authors, works, characters, technical terms, geographical names, myths, legends, and several appendices. Delhi: Motilal Banarsidass. ISBN 978-81-208-0063-2. Guy L. Beck (1995). Sonic Theology: Hinduism and Sacred Sound. Motilal Banarsidass. ISBN 978-81-208-1261-1. Guy L. Beck (2006). Sacred Sound: Experiencing Music in World Religions. Wilfrid Laurier Univ. Press. ISBN 978-0-88920-421-8. Robert S.P. Beekes (2011). Comparative Indo-European Linguistics: An introduction, 2nd edition. John Benjamins Publishing. ISBN 978-90-272-8500-3. Benware, Wilbur (1974). The Study of Indo-European Vocalism in the 19th Century: From the Beginnings to Whitney and Scherer: A Critical-Historical Account. Benjamins. ISBN 978-90-272-0894-1. Shlomo Biderman (2008). Crossing Horizons: World, Self, and Language in Indian and Western Thought. Columbia University Press. ISBN 978-0-231-51159-9. Claire Bowern; Bethwyn Evans (2015). The Routledge Handbook of Historical Linguistics. Routledge. ISBN 978-1-317-74324-8. John L. Brockington (1998). The Sanskrit Epics. BRILL Academic. ISBN 978-90-04-10260-6. Johannes Bronkhorst (1993). "Buddhist Hybrid Sanskrit: The Original Language in "Aspects of Buddhist Sanskrit: Proceedings of the International Symposium on the Language of Sanskrit Buddhist Texts"". University of Lausanne, Switzerland; Vidyapith Varanasi, India: 396–423. Bryant, Edwin (2001). The Quest for the Origins of Vedic Culture: The Indo-Aryan Migration Debate. Oxford: Oxford University Press. ISBN 978-0-19-513777-4. Edwin Francis Bryant; Laurie L. Patton (2005). The Indo-Aryan Controversy: Evidence and Inference in Indian History. Psychology Press. ISBN 978-0-7007-1463-6. Thomas Burrow (2001). The Sanskrit Language. Motilal Banarsidass. ISBN 978-81-208-1767-8. Robert E. Buswell Jr.; Donald S. Lopez Jr. (2013). The Princeton Dictionary of Buddhism. Princeton University Press. ISBN 978-1-4008-4805-8. George Cardona (2012). Sanskrit Language. Encyclopaedia Britannica. James Clackson (18 October 2007). Indo-European Linguistics: An Introduction. Cambridge University Press. ISBN 978-1-139-46734-6. Coulson, Michael (1992). Sanskrit : an introduction to the classical language, 2nd Edition as revised by Richard Gombrich and James Benson. Random House. ISBN 978-0-340-56867-5. OCLC 26550827. Michael Coulson; Richard Gombrich; James Benson (2011). Complete Sanskrit: A Teach Yourself Guide. Mcgraw-Hill. ISBN 978-0-07-175266-4. Harold G. Coward (1990). The Philosophy of the Grammarians, in Encyclopedia of Indian Philosophies Volume 5 (Editor: Karl Potter). Princeton University Press. ISBN 978-81-208-0426-5. Suniti Kumar Chatterji (1957). "Indianism and Sanskrit". Annals of the Bhandarkar Oriental Research Institute. Bhandarkar Oriental Research Institute. 38 (1/2): 1–33. JSTOR 44082791. Peter T. Daniels (1996). The World's Writing Systems. Oxford University Press. ISBN 978-0-19-507993-7. Will Durant (1963). Our oriental heritage. Simon & Schuster. ISBN 978-1567310122. Eltschinger, Vincent (2017). "Why Did the Buddhists Adopt Sanskrit?". Open Linguistics. 3 (1). doi:10.1515/opli-2017-0015. ISSN 2300-9969. J. Filliozat (1955). "Sanskrit as Language of Communication". Annals of the Bhandarkar Oriental Research Institute. Bhandarkar Oriental Research Institute. 36 (3/4): 179–189. JSTOR 44082954. Pierre-Sylvain Filliozat (2000). The Sanskrit Language: An Overview : History and Structure, Linguistic and Philosophical Representations, Uses and Users. Indica. ISBN 978-81-86569-17-7. Benjamin W. Fortson, IV (2011). Indo-European Language and Culture: An Introduction. John Wiley & Sons. ISBN 978-1-4443-5968-8. Robert P. Goldman; Sally J Sutherland Goldman (2002). Devavāṇīpraveśikā: An Introduction to the Sanskrit Language. Center for South Asia Studies, University of California Press. Thomas V. Gamkrelidze; Vjaceslav V. Ivanov (2010). Indo-European and the Indo-Europeans: A Reconstruction and Historical Analysis of a Proto-Language and Proto-Culture. Part I: The Text. Part II: Bibliography, Indexes. Walter de Gruyter. ISBN 978-3-11-081503-0. Thomas V. Gamkrelidze; V. V. Ivanov (1990). 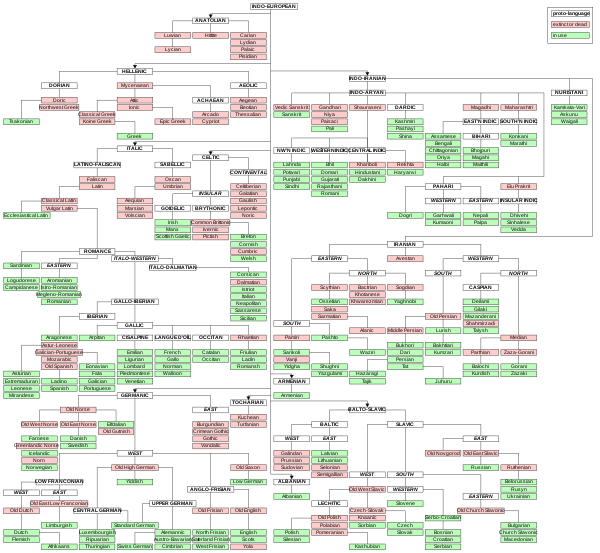 "The Early History of Indo-European Languages". Scientific American. Nature America. 262 (3): 110–117. doi:10.1038/scientificamerican0390-110. JSTOR 24996796. Jack Goody (1987). The Interface Between the Written and the Oral. Cambridge University Press. ISBN 978-0-521-33794-6. Reinhold Grünendahl (2001). South Indian Scripts in Sanskrit Manuscripts and Prints: Grantha Tamil, Malayalam, Telugu, Kannada, Nandinagari. Otto Harrassowitz Verlag. ISBN 978-3-447-04504-9. Houben, Jan (1996). Ideology and status of Sanskrit: contributions to the history of the Sanskrit language. Brill. ISBN 978-90-04-10613-0. Hanneder, J. (2002). "On "The Death of Sanskrit"". Indo-Iranian Journal. Brill Academic Publishers. 45 (4): 293–310. doi:10.1023/a:1021366131934. Hock, Hans Henrich (1983). Kachru, Braj B (ed.). "Language-death phenomena in Sanskrit: grammatical evidence for attrition in contemporary spoken Sanskrit". Studies in the Linguistic Sciences. 13:2. Barbara A. Holdrege (2012). Veda and Torah: Transcending the Textuality of Scripture. State University of New York Press. ISBN 978-1-4384-0695-4. Michael C. Howard (2012). Transnationalism in Ancient and Medieval Societies: The Role of Cross-Border Trade and Travel. McFarland. ISBN 978-0-7864-9033-2. Dhanesh Jain; George Cardona (2007). The Indo-Aryan Languages. Routledge. ISBN 978-1-135-79711-9. Stephanie W. Jamison; Joel P. Brereton (2014). The Rigveda: 3-Volume Set, Volume I. Oxford University Press. ISBN 978-0-19-972078-1. A. Berriedale Keith (1993). A history of Sanskrit literature. Motilal Banarsidass. ISBN 978-81-208-1100-3. Damien Keown; Charles S. Prebish (2013). Encyclopedia of Buddhism. Taylor & Francis. ISBN 978-1-136-98595-9. Anne Kessler-Persaud (2009). Knut A. Jacobsen; et al. (eds.). Brill's Encyclopedia of Hinduism: Sacred texts, ritual traditions, arts, concepts. Brill Academic. ISBN 978-90-04-17893-9. Jared Klein; Brian Joseph; Matthias Fritz (2017). Handbook of Comparative and Historical Indo-European Linguistics: An International Handbook. Walter De Gruyter. ISBN 978-3-11-026128-8. Dalai Lama (1979). "Sanskrit in Tibetan Literature". The Tibet Journal. 4 (2): 3–5. JSTOR 43299940. Winfred Philipp Lehmann (1996). Theoretical Bases of Indo-European Linguistics. Psychology Press. ISBN 978-0-415-13850-5. Donald S. Lopez Jr. (1995). "Authority and Orality in the Mahāyāna". Numen. Brill Academic. 42 (1): 21–47. doi:10.1163/1568527952598800. JSTOR 3270278. Mahadevan, Iravatham (2003). Early Tamil Epigraphy from the Earliest Times to the Sixth Century A.D. Harvard University Press. ISBN 978-0-674-01227-1. Malhotra, Rajiv (2016). The Battle for Sanskrit: Is Sanskrit Political or Sacred, Oppressive or Liberating, Dead or Alive?. Harper Collins. ISBN 978-9351775386. J. P. Mallory; Douglas Q. Adams (1997). Encyclopedia of Indo-European Culture. Taylor & Francis. ISBN 978-1-884964-98-5. Mallory, J. P. (1992). "In Search of the Indo-Europeans / Language, Archaeology and Myth". Praehistorische Zeitschrift. Walter de Gruyter GmbH. 67 (1). doi:10.1515/pz-1992-0118. ISSN 1613-0804. Colin P. Masica (1993). The Indo-Aryan Languages. Cambridge University Press. ISBN 978-0-521-29944-2. Michael Meier-Brügger (2003). Indo-European Linguistics. Walter de Gruyter. ISBN 978-3-11-017433-5. Michael Meier-Brügger (2013). Indo-European Linguistics. Walter de Gruyter. ISBN 978-3-11-089514-8. Matilal, Bimal (2015). The word and the world : India's contribution to the study of language. New Delhi, India Oxford: Oxford University Press. ISBN 978-0-19-565512-4. OCLC 59319758. Maurer, Walter (2001). The Sanskrit language: an introductory grammar and reader. Surrey, England: Curzon. ISBN 978-0-7007-1382-0. J. P. Mallory; D. Q. Adams (2006). The Oxford Introduction to Proto-Indo-European and the Proto-Indo-European World. Oxford University Press. ISBN 978-0-19-928791-8. V. RAGHAVAN (1965). "Sanskrit". Indian Literature. Sahitya Akademi. 8 (2): 110–115. JSTOR 23329146. MacDonell, Arthur (2004). A History Of Sanskrit Literature. Kessinger Publishing. ISBN 978-1-4179-0619-2. Sir Monier Monier-Williams (2005). A Sanskrit-English Dictionary: Etymologically and Philologically Arranged with Special Reference to Cognate Indo-European Languages. Motilal Banarsidass. ISBN 978-81-208-3105-6. Tim Murray (2007). Milestones in Archaeology: A Chronological Encyclopedia. ABC-CLIO. ISBN 978-1-57607-186-1. Ramesh Chandra Majumdar (1974). Study of Sanskrit in South-East Asia. Sanskrit College. Nedi︠a︡lkov, V. P. (2007). Reciprocal constructions. Amsterdam Philadelphia: J. Benjamins Pub. Co. ISBN 978-90-272-2983-0. Oberlies, Thomas (2003). A Grammar of Epic Sanskrit. Berlin New York: Walter de Gruyter. ISBN 978-3-11-014448-2. Petersen, Walter (1912). "Vedic, Sanskrit, and Prakrit". Journal of the American Oriental Society. American Oriental Society. 32 (4): 414–428. doi:10.2307/3087594. ISSN 0003-0279. JSTOR 3087594. Sheldon Pollock (2009). The Language of the Gods in the World of Men: Sanskrit, Culture, and Power in Premodern India. University of California Press. ISBN 978-0-520-26003-0. Pollock, Sheldon (2001). "The Death of Sanskrit". Comparative Studies in Society and History. Cambridge University Press. 43 (2): 392–426. doi:10.1017/s001041750100353x. JSTOR 2696659. V. RAGHAVAN (1968). "Sanskrit: Flow of Studies". Indian Literature. Sahitya Akademi. 11 (4): 82–87. JSTOR 24157111. Colin Renfrew (1990). Archaeology and Language: The Puzzle of Indo-European Origins. Cambridge University Press. ISBN 978-0-521-38675-3. Louis Renou; Jagbans Kishore Balbir (2004). A history of Sanskrit language. Ajanta. ISBN 978-8-1202-05291. A. M. Ruppel (2017). The Cambridge Introduction to Sanskrit. Cambridge University Press. ISBN 978-1-107-08828-3. Salomon, Richard (1998). Indian Epigraphy: A Guide to the Study of Inscriptions in Sanskrit, Prakrit, and the other Indo-Aryan Languages. Oxford University Press. ISBN 978-0-19-535666-3. Salomon, Richard (1995). "On the Origin of the Early Indian Scripts". Journal of the American Oriental Society. 115 (2): 271–279. doi:10.2307/604670. JSTOR 604670. Salomon, Richard (1998). Indian Epigraphy: A Guide to the Study of Inscriptions in Sanskrit, Prakrit, and the Other Indo-Aryan Languages. Oxford: Oxford University Press. ISBN 978-0-19-509984-3. Malati J. Shendge (1997). The Language of the Harappans: From Akkadian to Sanskrit. Abhinav Publications. ISBN 978-81-7017-325-0. Seth, Sanjay (2007). Subject lessons: the Western education of colonial India. Durham, NC: Duke University Press. ISBN 978-0-8223-4105-5. Staal, J. F. (1963). "Sanskrit and Sanskritization". The Journal of Asian Studies. Cambridge University Press. 22 (3): 261–275. doi:10.2307/2050186. JSTOR 2050186. Angus Stevenson; Maurice Waite (2011). Concise Oxford English Dictionary. Oxford University Press. ISBN 978-0-19-960110-3. Philipp Strazny (2013). Encyclopedia of Linguistics. Routledge. ISBN 978-1-135-45522-4. Paul Thieme (1958). "The Indo-European Language". Scientific American. Nature. 199 (4): 63–78. doi:10.1038/scientificamerican1058-63. JSTOR 24944793. Peter van der Veer (2008). "Does Sanskrit Knowledge Exist?". Journal of Indian Philosophy. Springer. 36 (5/6): 633–641. doi:10.1007/s10781-008-9038-8. JSTOR 23497502. Wayman, Alex (1965). "The Buddhism and the Sanskrit of Buddhist Hybrid Sanskrit". Journal of the American Oriental Society. 85 (1): 111–115. doi:10.2307/597713. JSTOR 597713. Annette Wilke; Oliver Moebus (2011). Sound and Communication: An Aesthetic Cultural History of Sanskrit Hinduism. Walter de Gruyter. ISBN 978-3-11-024003-0. Whitney, W. D. (1885). "The Roots of the Sanskrit Language". Transactions of the American Philological Association. JSTOR. 16: 5–29. doi:10.2307/2935779. ISSN 0271-4442. JSTOR 2935779. Witzel, M (1997). Inside the texts, beyond the texts: New approaches to the study of the Vedas (PDF). Cambridge, Massachusetts: Harvard University Press. Jamison, Stephanie (2008). Roger D. Woodard (ed.). The Ancient Languages of Asia and the Americas. Cambridge University Press. ISBN 978-0-521-68494-1.